Swiss pocketknife. Just like the pocketknife can conjure up a nail file, saw and Allen key, the Slider can transform itself into a kind of all-in-one tablet with a real keyboard. More work efficiency under Android? 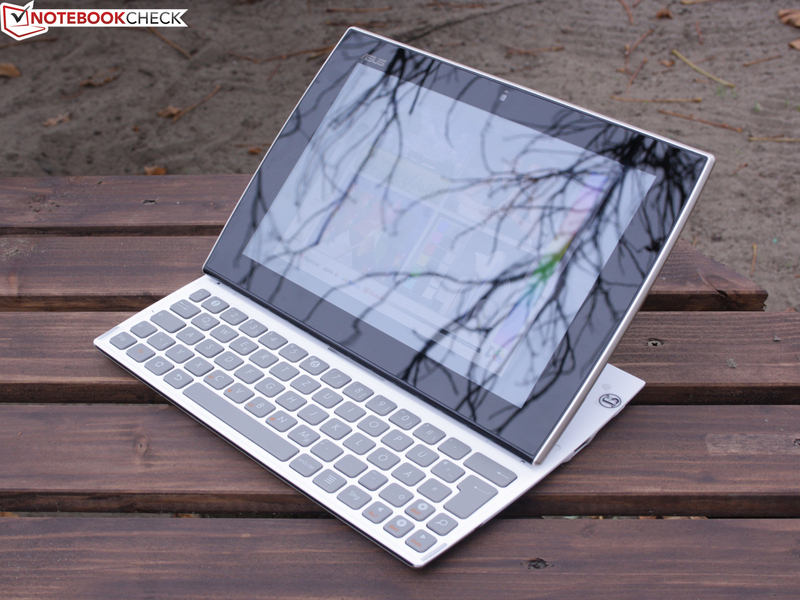 Asus Eee Pad Slider SL101 32 GB: A real added value due to the built-in keyboard? The tablet market is on the move. Android has established itself beside iOS. 5, 7, 9 and 10 inch devices as well as low priced models start at €200. Manufacturers who want to attract attention or sell high quantities have to either offer a product with unique features or an appealing price. Sony does the former with its Tablet P with two 5 inch TFTs and that can be folded. The second strategy is used by manufacturers like ViewSonic (ViewPad 10s, starts at €195), Lenovo (IdeaPad A1 16GB, starts at €200), Hannspree (10.1" HannsPad, starts at €230) or Prestigio (MultiPad PMP5080B, starts at €195). Where is Asus positioned? The manufacturer doesn't have a low-cost tablet in its range; the cheapest product is the Eee Pad Transformer TF101 32 GB (starts at €400). 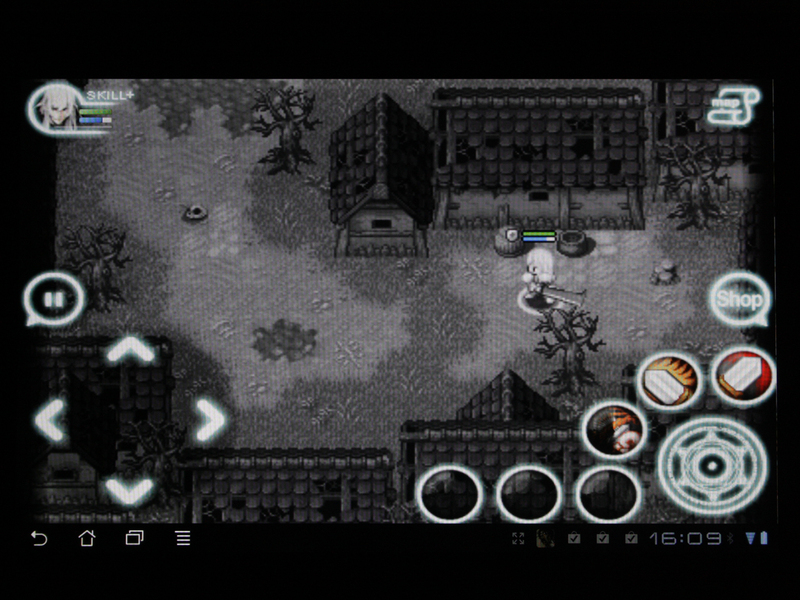 The strategy used right from the start was to furnish the tablet with a special advantage. 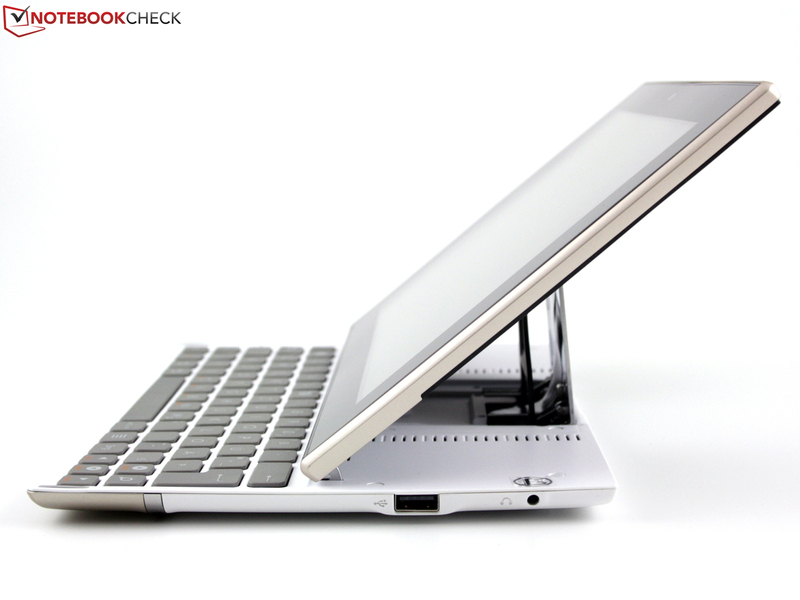 The Transformer, for example, mutates to a netbook with keyboard and touchpad when the KeyBoardDock is connected. 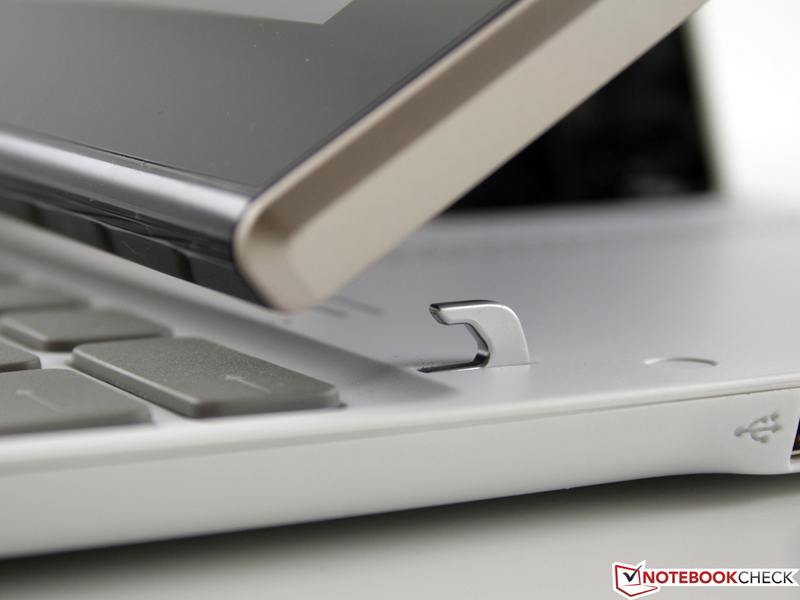 The present Eee Pad Slider SL101 goes even a step further by hiding the keyboard underneath the tablet and expanding it by a hinge. A real benefit for typing-eager Android users? 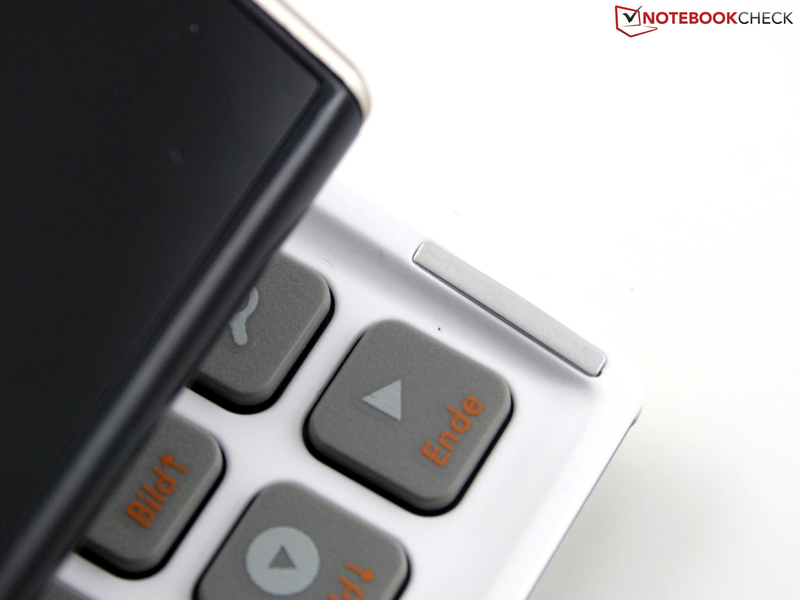 Which drawbacks does the built-in keyboard have in view of size, weight, stability and battery life? The answers can be found in this review. Asus uses plastic and a hard magnesium alloy for its 10.1 inch tablet. The weight of 976 grams is relatively high for tablet relations, but this has to be expected in view of the built-in keyboard. Comparisons: The 10 inch Sony S only weighs 591 grams; an iPad 2 (9.7 inch) achieves 601 grams and a Samsung Galaxy Tab 10.1v (10.1 inch) only weighs 574 grams. Thus, the Slider is a real heavy-weight. 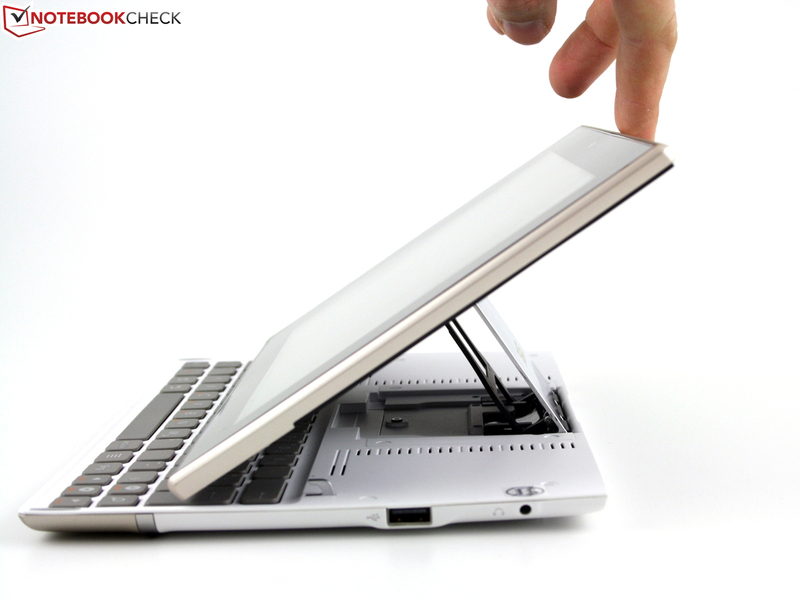 However, this is unavoidable because the SL101's case has to cope with a much higher mechanical load than a standard tablet. Both the bottom and the top have to be stable. 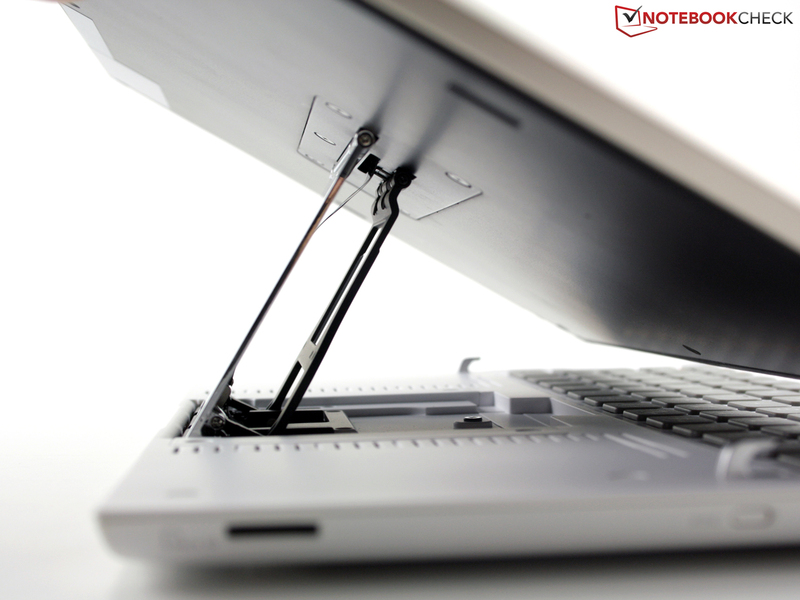 The hinge and its corresponding sliding mechanism not only have to hold the screen, they also keep it sufficiently taut in both an opened and closed state together with magnets and bolts. 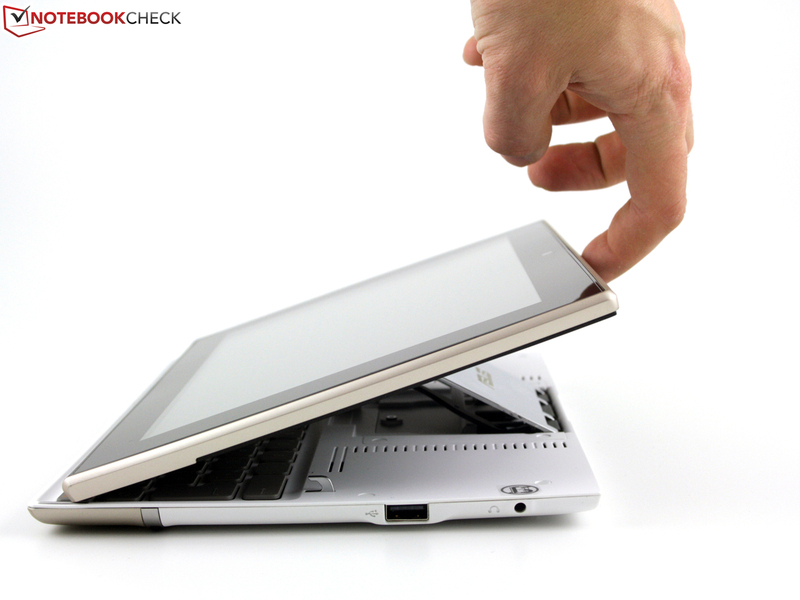 In order to deal with this burden, Asus had to build in rigid metal, which is found on the TFT's back and the hinge. 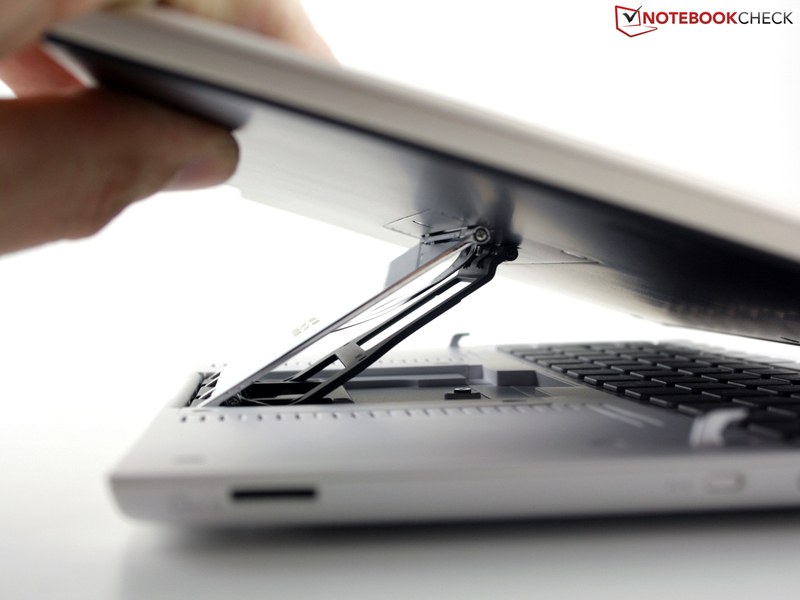 The long battery life also has to come from somewhere: The lithium polymer battery contributes its part to the weight. 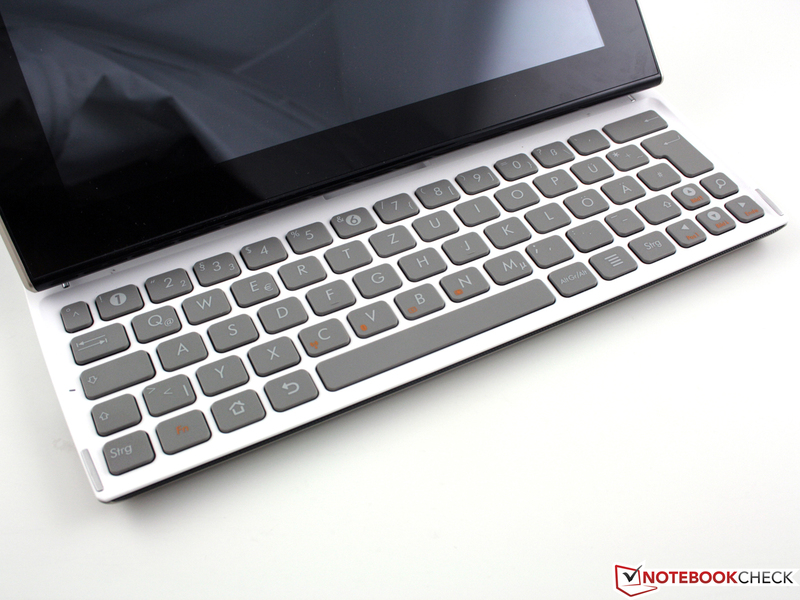 It's integrated on the same level as the device's keyboard. We didn't find any reason for complaint in the workmanship and we believe that the sliding mechanism will last for a long time when used normally and with a bit of care. The SL101's feel can't completely hide the plastic sensation, but the rubber coated bottom compensates that. It provides the Slider with a non-slip grip. 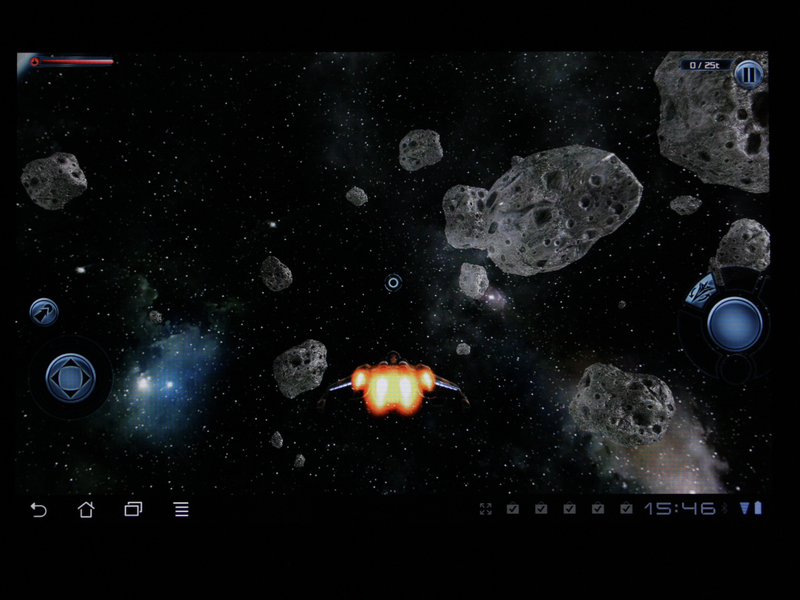 The Slider is generously equipped with interfaces for a tablet. 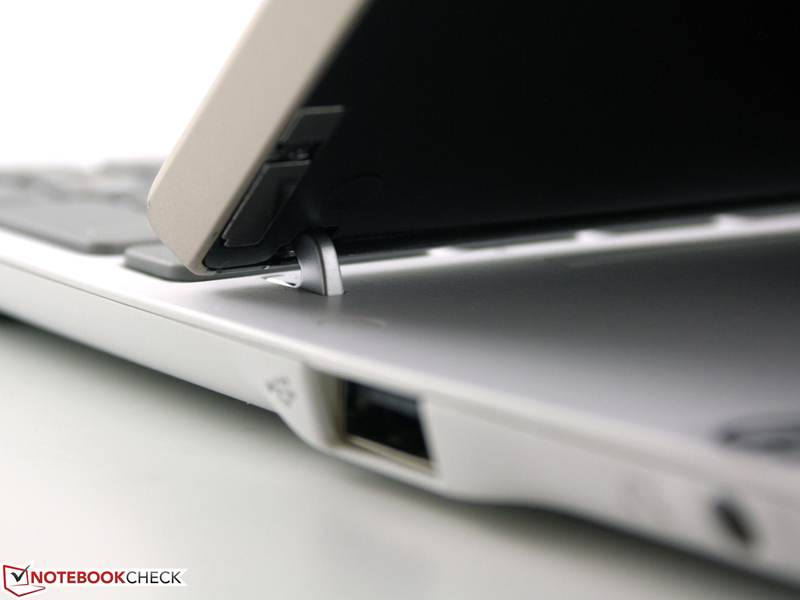 The 40 pin charging cable, which is also a USB cable for data transfer with the PC, is located on the case's rear. We can't say what options the manufacturer keeps open with so many pins. There aren't any accessories, such as a docking station. 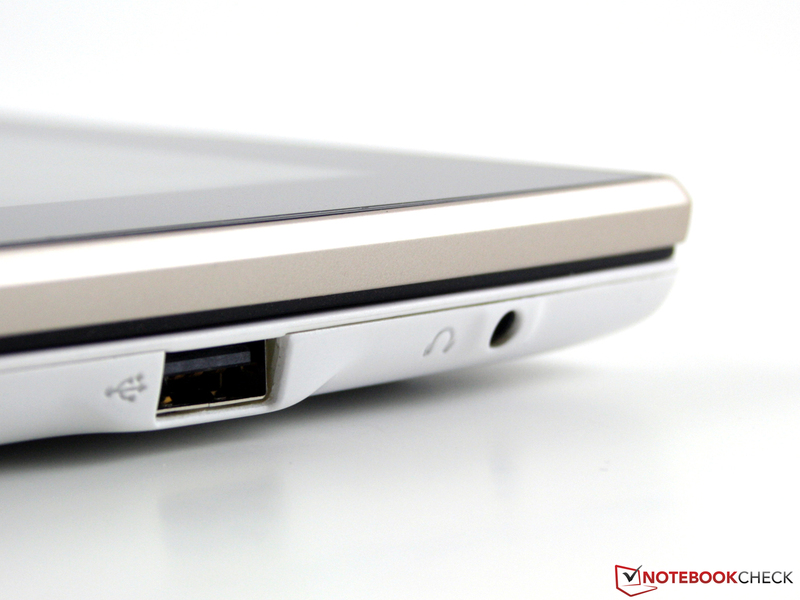 It is the same port that the Eee Pad Transformer has for connecting its keyboard dock. However, the Slider doesn't need it. 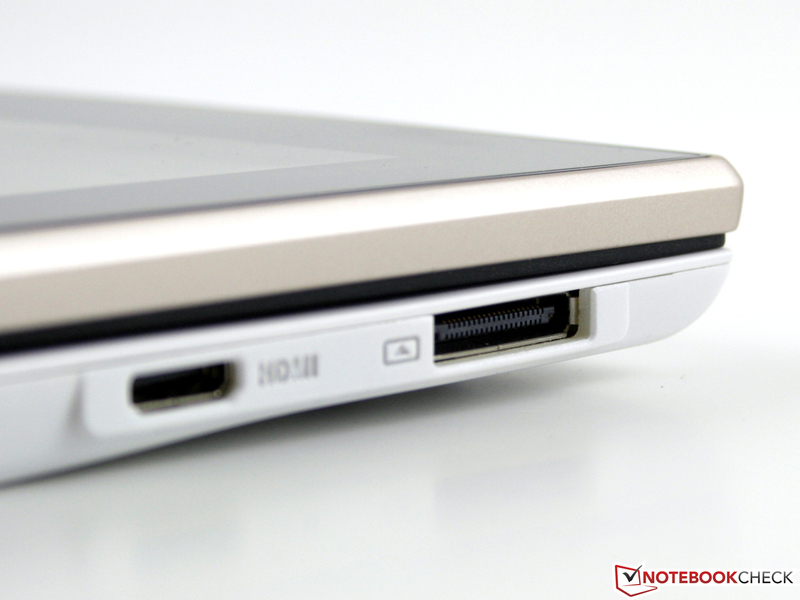 A mini HDMI and a big USB port almost convey a subnotebook experience. Most tablet use mini USB and micro HDMI for space reasons. In practical use, these connectors/ports are very delicate and can break when pulled out with a jerk. 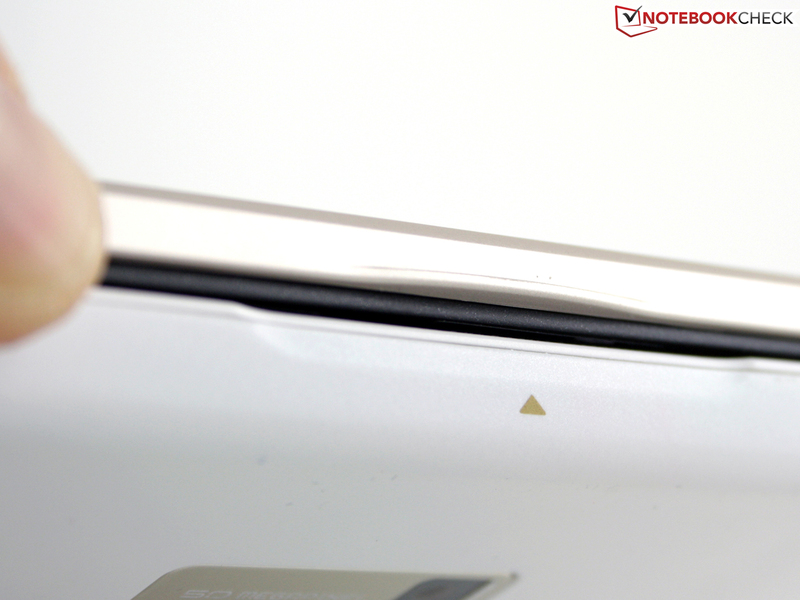 The internal 32 GB memory can be expanded with an additional 32 GB (maximum, SDHC) via a microSD card. Positive: Media files, such as movies or music, can be played directly from the SD card. 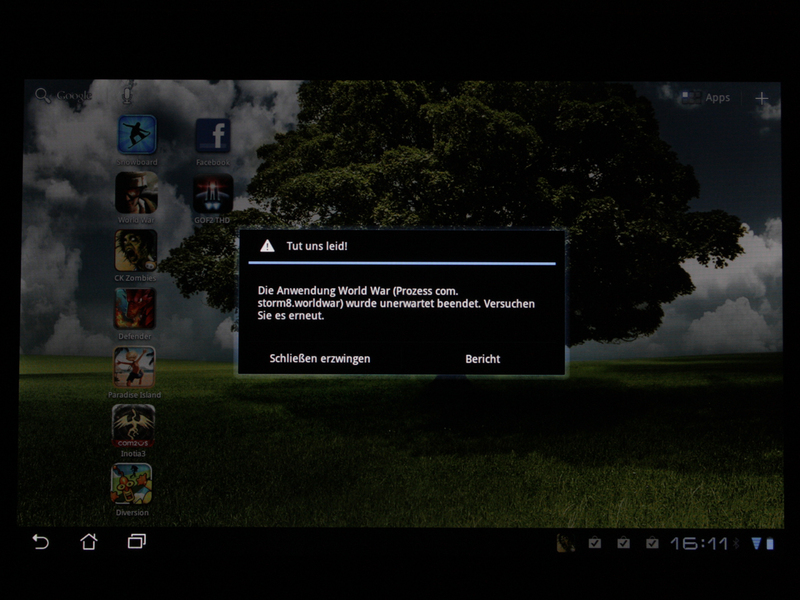 This is not a matter of course, as the Sony Tablet S proved (depending on the player). 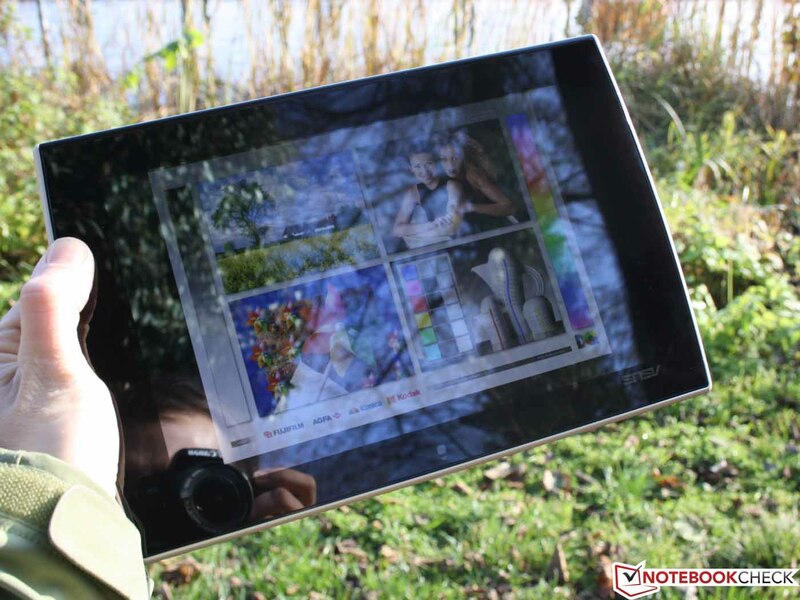 The Eee Pad Slider is only equipped with draft-n WLAN and Bluetooth 2.1 +EDR. A wifi+3G version doesn't exist. The device has A-GPS (Assisted GPS) that falls back on the mobile telecommunication network in addition to Satellite (interferences). The electronic compass that adapts the map's alignment in the Google Maps app, depending on the tablet's position, is great. Now no one can get lost in the city. Asus has installed Android 3.2.1 (Honeycomb update). The free OS is better customized to the requirements of tablets than the 2.x version, which is often sold in cheap tablets. It gets even better: According to Asus, the Slider is ready to update to the next Android 4.0 generation, Ice Cream Sandwich. Among other things, the camera app, speech recognition and the browser have been improved. As for preinstalled apps, we find Google Mail (email client), MyLibrary (eBook reader) and the multi-player, MyNet. The latter not only renders music, videos and pictures, it can also be used as a media server in the home network. Asus lives up to the Office claim made with the built-in keyboard with Polaris Office 3.0. The software creates documents, spreadsheets and presentations. The program is a complete changeover for Word users - just alone because the navigation has been optimized for finger inputs. Though it's not bad, novices should expect more basic than complex solutions. At least "CTRL+C" and "CTRL+V" work and spreadsheets and pictures can be pasted easily. 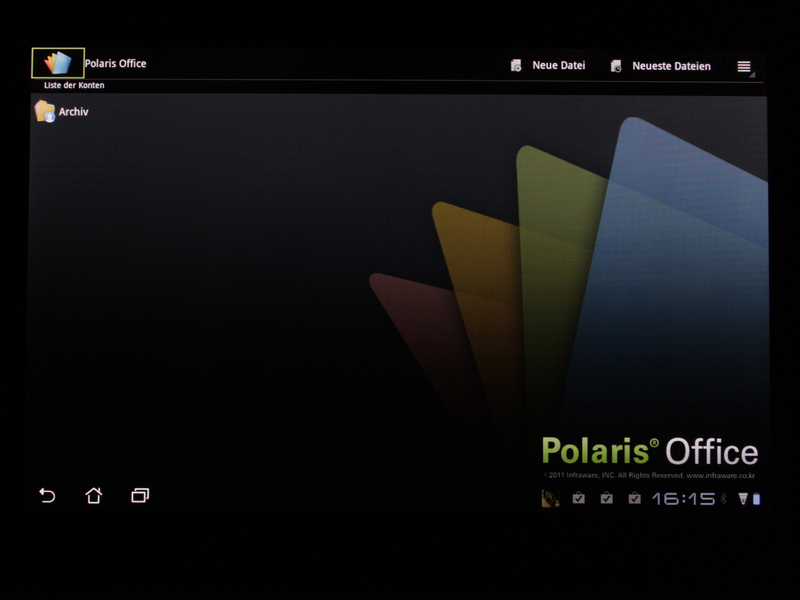 Polaris shows us how pleasant it can be when the sight isn't impaired by a virtual keyboard when writing a document. More applications are available on the well-known Android Market. 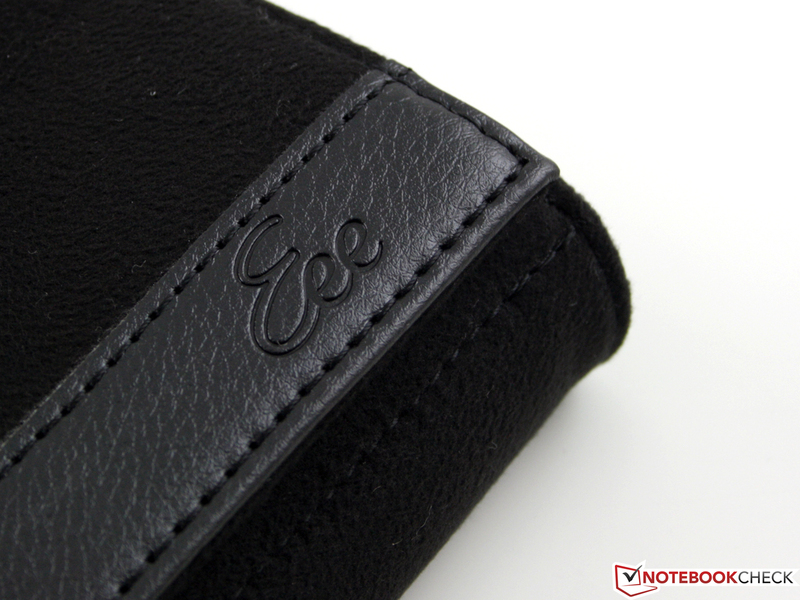 Besides the handy power adapter, a stable pouch made of a sturdy, synthetic leather material is found in the high quality box. 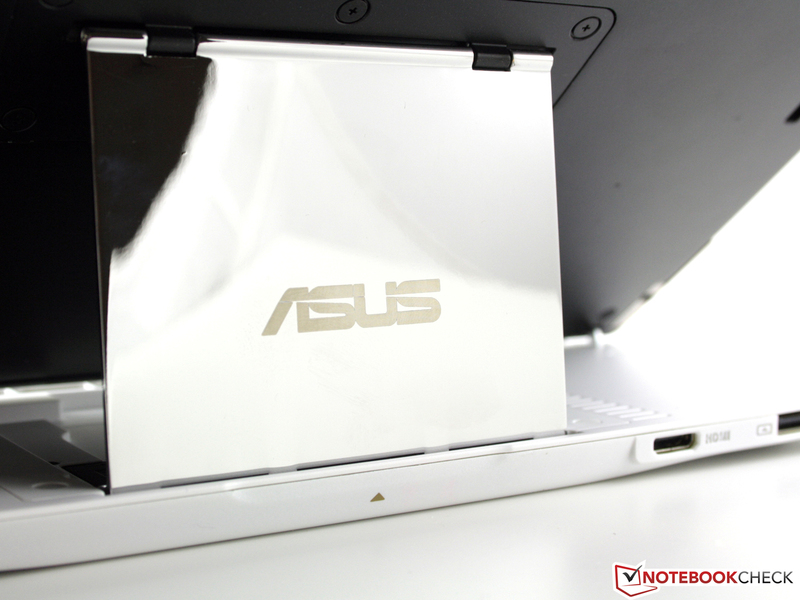 The case is adorned with an Asus branding. Asus grants a 24 month manufacturer warranty. 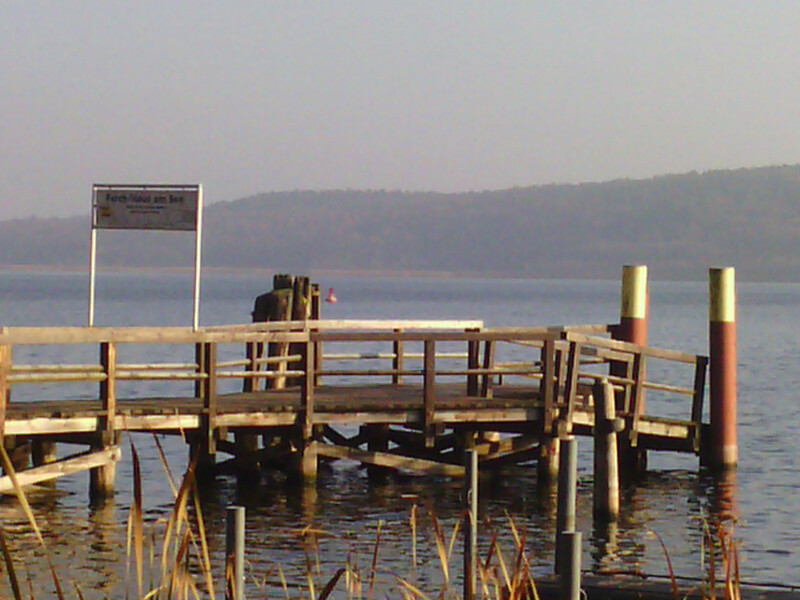 It includes a pick-up & return service within Germany and Austria. Warranty extensions up to 24 months (€65) and 12 months (€35) are available. Asus relies on a high-end rear camera and a low resolution front camera (1.2 MP, 1024x768). 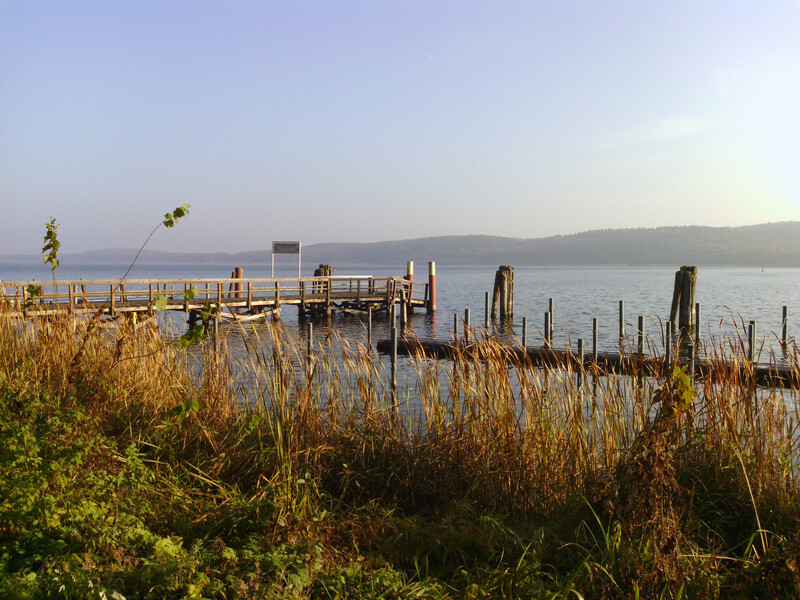 The rear cam, however, takes pictures in 5 megapixels with up to 2592 x 1944 pixels (4:3). We can set a digital zoom of up to 8x in the webcam app. 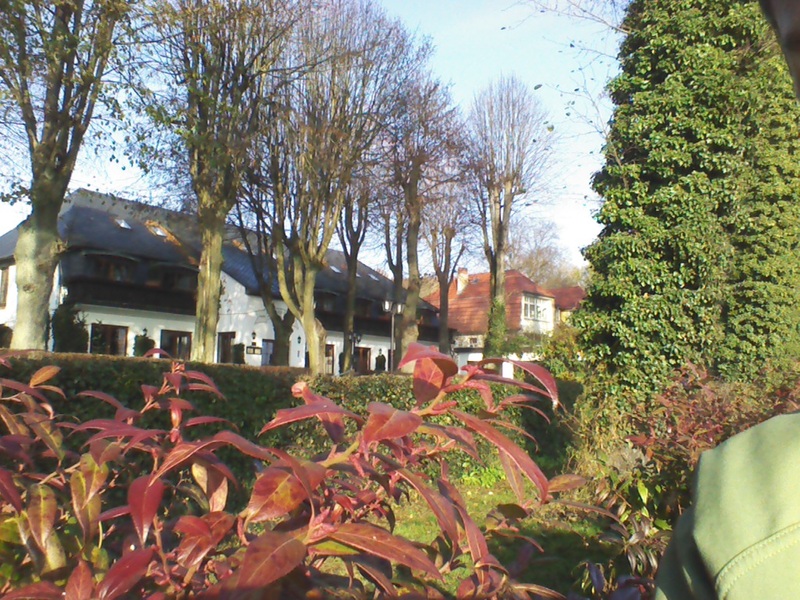 The picture quality when shooting with this zoom is very poor, even in sunshine. 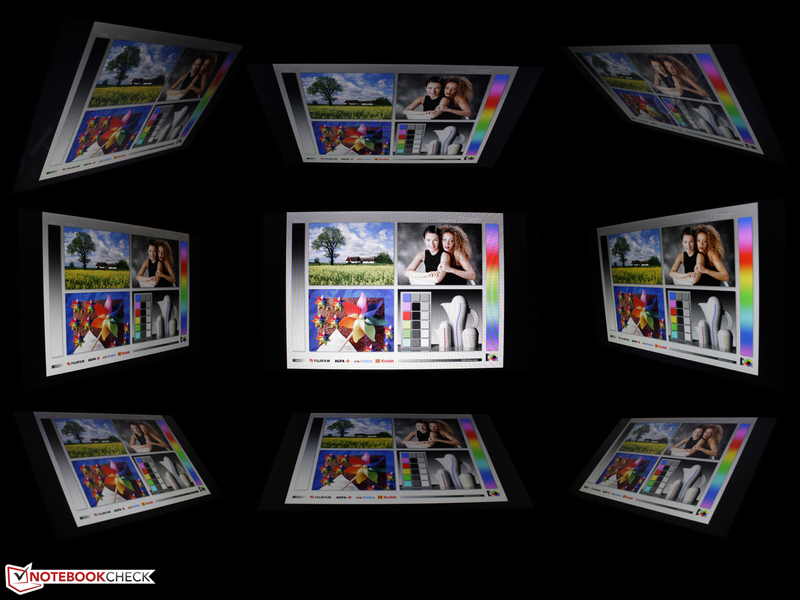 The pictures have realistic colors and are focused without the zoom. 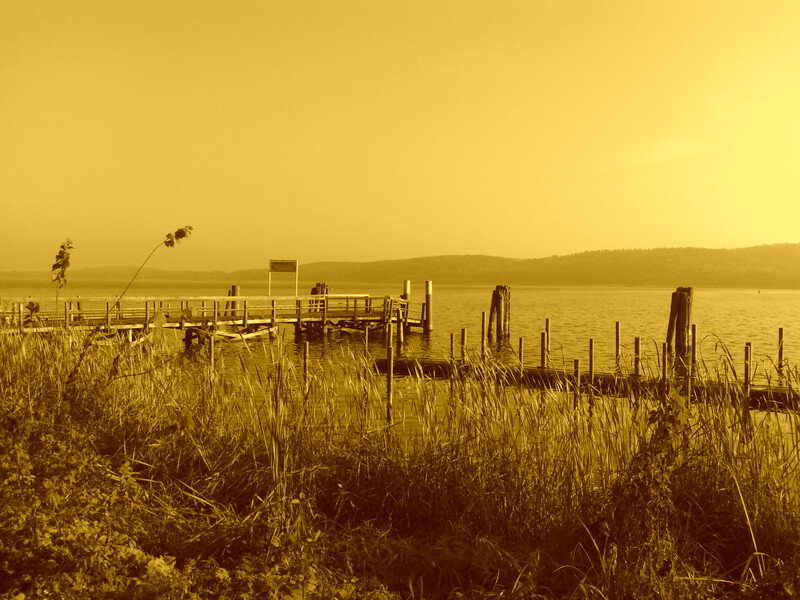 Three effects delight the photographer: Sepia, mono and negative effects are ultimately a gimmick that could be accomplished with any image editor in retrospect. The colors are also natural with the front, so face camera, but the faded pictures make a poor impression. The Slider's feature is the QWERTY keyboard. Pull the latch at the upper edge and the screen pushes itself into the final position. 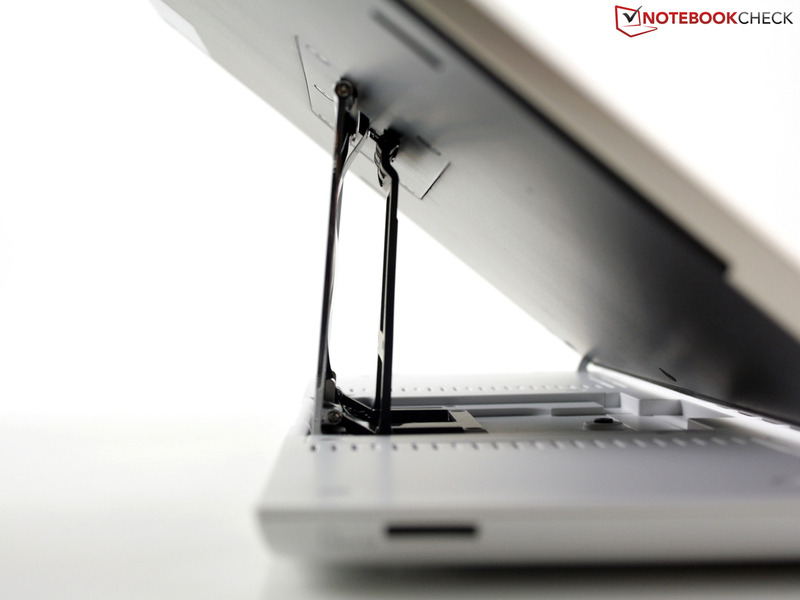 So that nothing wobbles or shakes, the screen's bottom locks into two hooks and is kept in place by the tension of a spring mechanism. 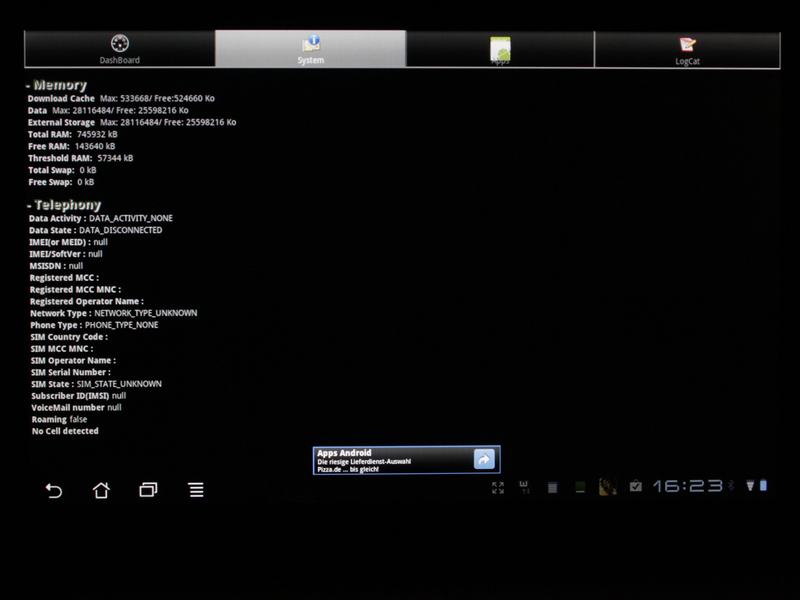 Thus, the screen can't close on its own when handling the device. The keys are comparable with those of a netbook. The key drop is short, but the pressure point is sufficiently clear. We experience the stroke as firm, but not hard and loud. The typing noise is sooner subtle and muffled. The marks for touch-typists on F and J are available. 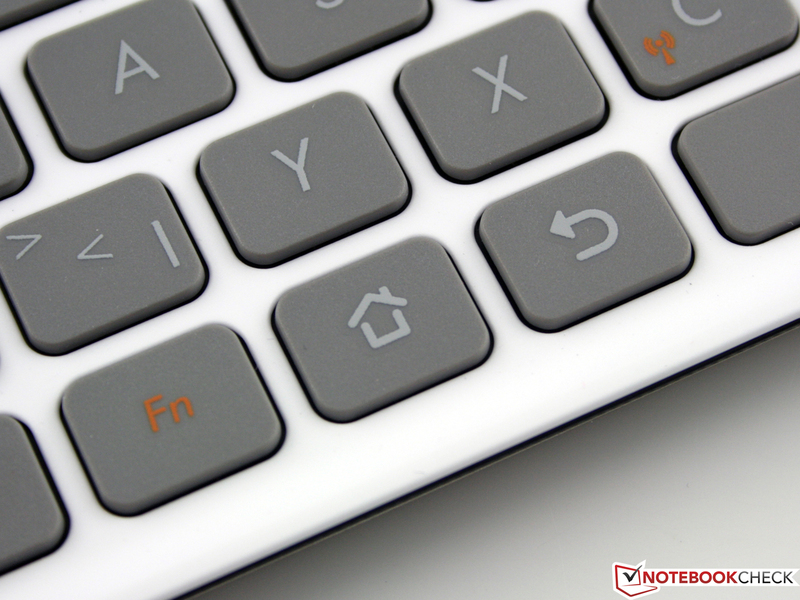 Typing on the keys needs getting used to compared to a notebook (or even a desktop). The keys are completely level. A concavity would have improved the finger's accuracy. The two tiny shift keys (right + left) are a bit irritating as they frequently lead to misentries. There are no escape key or F keys. Though ESC would still have been useful, Android simply doesn't need the F1 to F12 keys from the obsolete Windows tradition. Basically, the drawbacks are just a matter of getting used to. 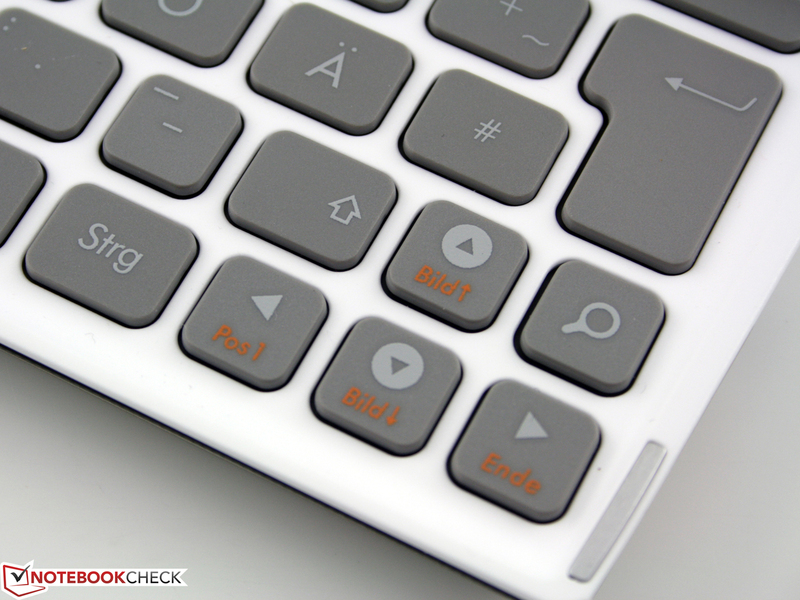 We quite like the function keys that have been marked clearly in orange. They enable/disable the wireless connections (WLAN/BT) and adjust the brightness. A real drawback of the keyboard is the protruding lower edge, which is especially annoying when using the space bar. 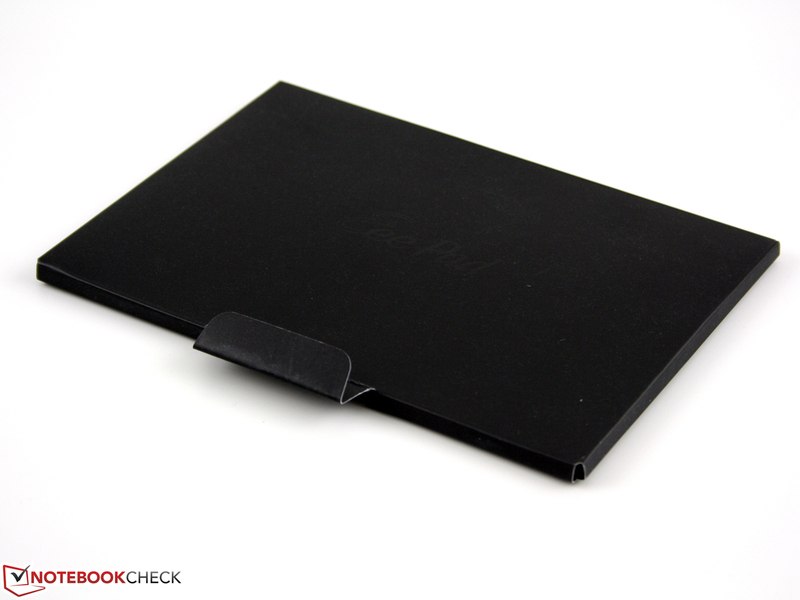 The lack of a wrist rest can be compensated by placing a thin book or two magazines in front of the device. However, hovering the hands in the air when the Slider is used on the lap gets tiring over a longer period. 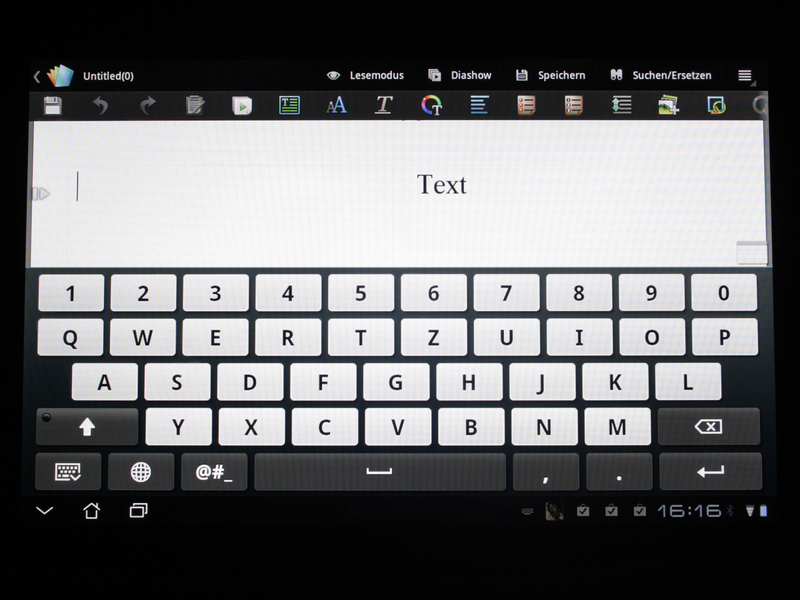 The virtual keyboard only appears in tablet mode, the default setting ex-factory. As soon as the Slider is opened, it's faded out. This is practical since that provides more visibility in an Office window or the web browser. Depending on preferences, the virtual and the physical keyboard can be used simultaneously. But we use voice inputting for entering web URLs. The microphone button (upper right) is available in the browser for this. Even longer web addresses are recognized correctly. 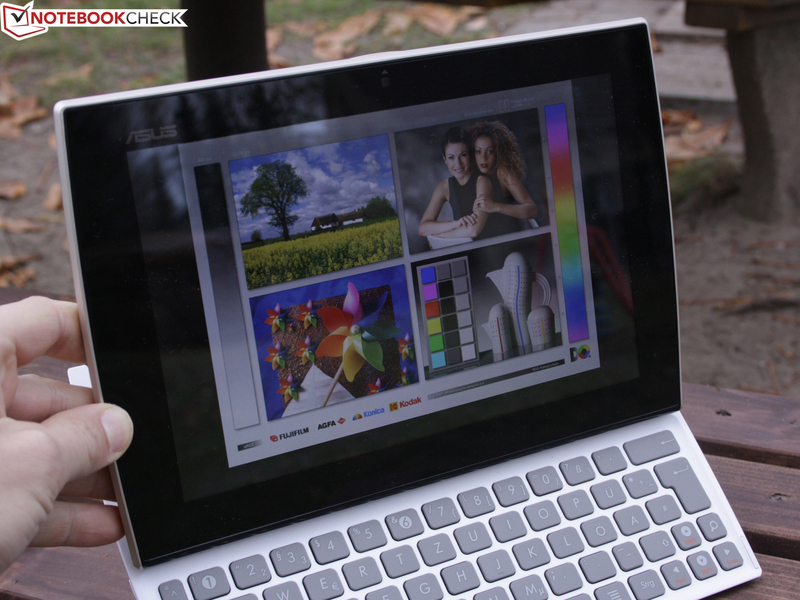 The Slider is, like all tablets, equipped with sensors. One sensor detects the tablets alignment in three directions. The OS requires this for aligning the screen content (landscape/portrait). The realignment is fast. 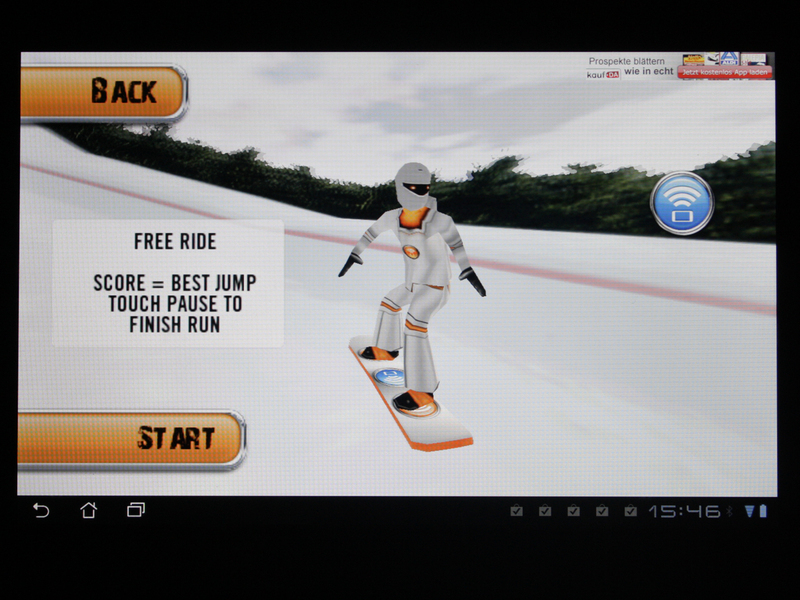 Games can use the sensor for controlling a character or a vehicle (race games, snowboard). The compass is handy. It shows the user the direction of sight on maps (Google Maps), for example. 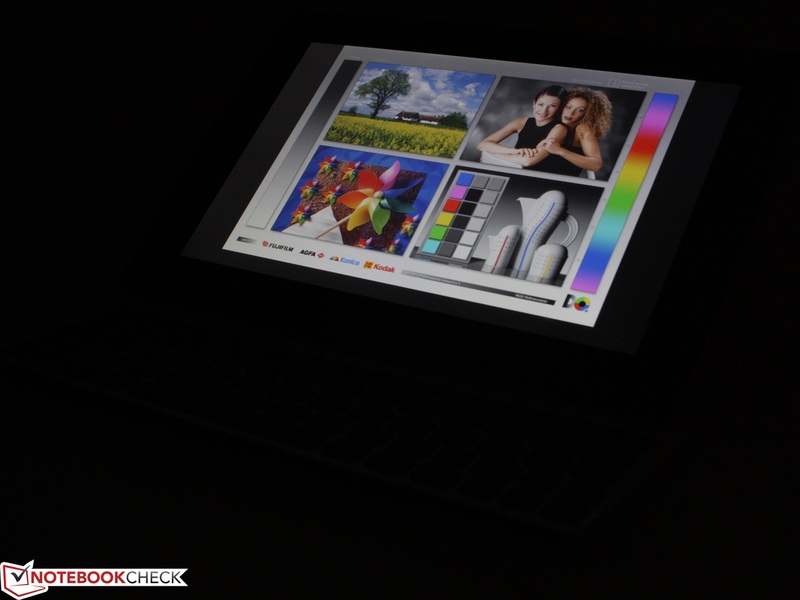 The light sensor (via front webcam) measures the ambient light and sets the screen brightness automatically. This function can of course be disabled. 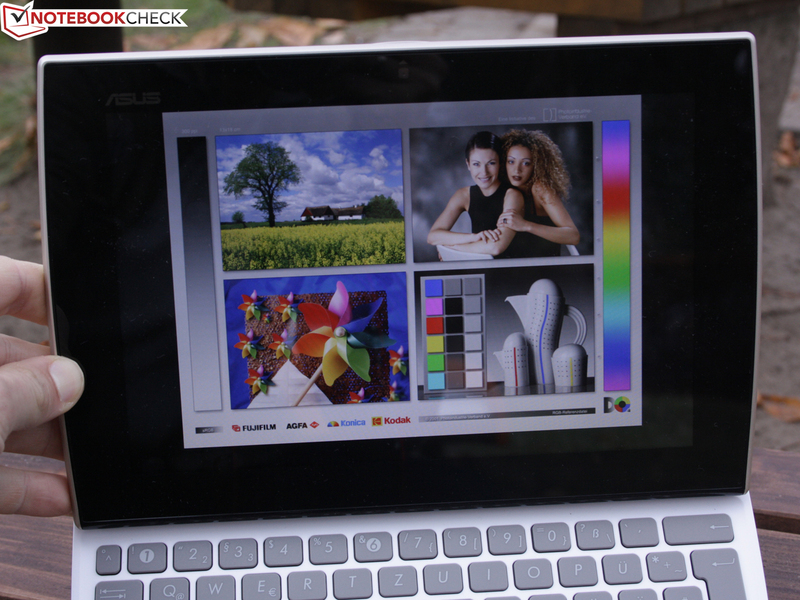 Asus relies on an IPS screen (in plane switching) with a resolution of 1280x800 pixels. This is a typical resolution for 10.1 inch tablets: Iconia Tab W500 (TN, 1280x800), Galaxy Tab 10.1v (IPS, 1280x800) and Motorola Xoom (IPS, 1280x800). 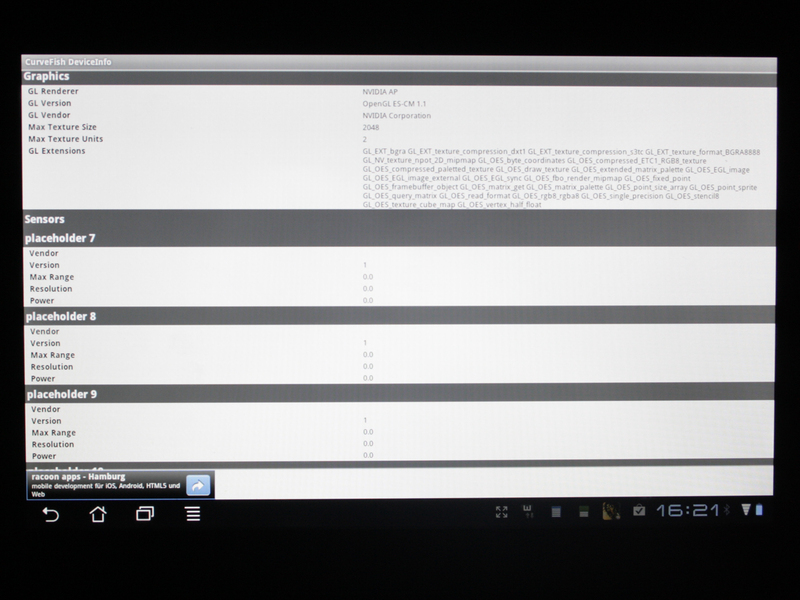 The exception: iPad2 (IPS, 1024x768). 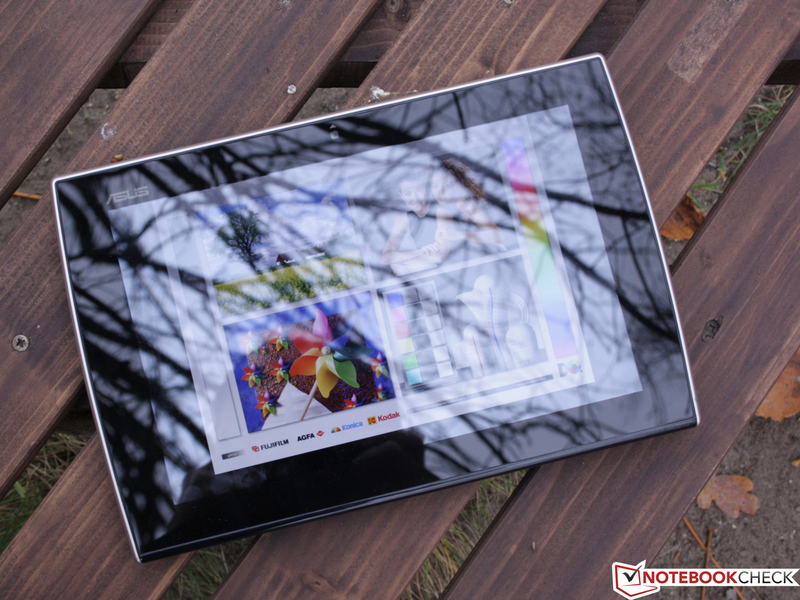 The surface is made of scratch-resistant gorilla glass. We measure the black value in the highest brightness setting in the center and determine 0.47 cd/m2. This results in a good, but not perfect contrast of 626:1. Black doesn't look as extremely dark and crisp as, for example, in the BlackBerry Playbook (780:1), iPad 2 (843:1), Iconia Tab W500 (881:1), Galaxy Tab 10.1 (805:1) or the Motorola Xoom (1491:1) with extremely vivid colors. The average brightness is lower than in the Playbook (491 cd/m²), iPad 2 (368), LG V900 (381), Sony Tablet S (334), Galaxy Tab 10.1 (305), Motorola Xoom (304) or Acer Iconia Tab W500 (306). 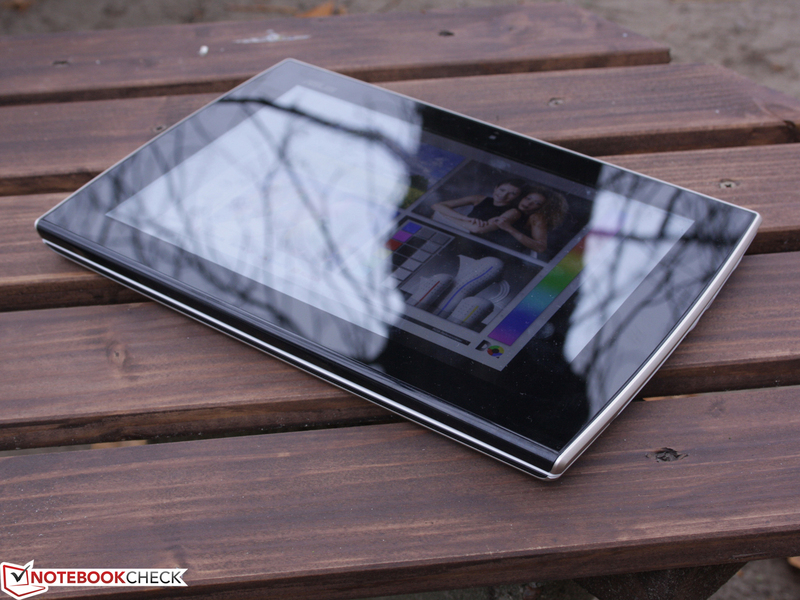 But it is especially the contrast that is below the average of high-end tablets. The brightness suffices to read the display well indoors. However, it gets difficult outdoors, particularly in sunlight. The desktop isn't just simply too dark, but the intensely reflective surface is also extremely disturbing. 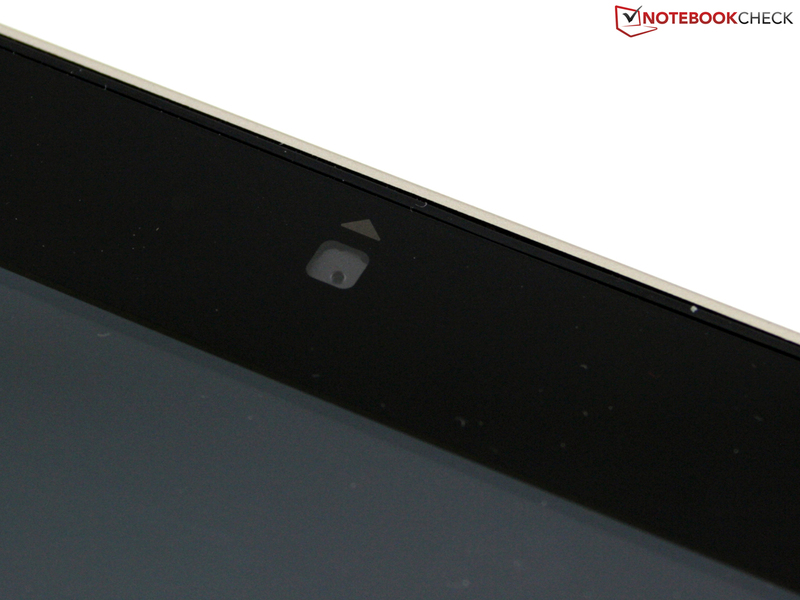 This negative quality is, more or less pronounced, common for all consumer tablets. The brightness is sufficient to see enough on the screen both indoors and out. The reflective surface however upsets any plans. 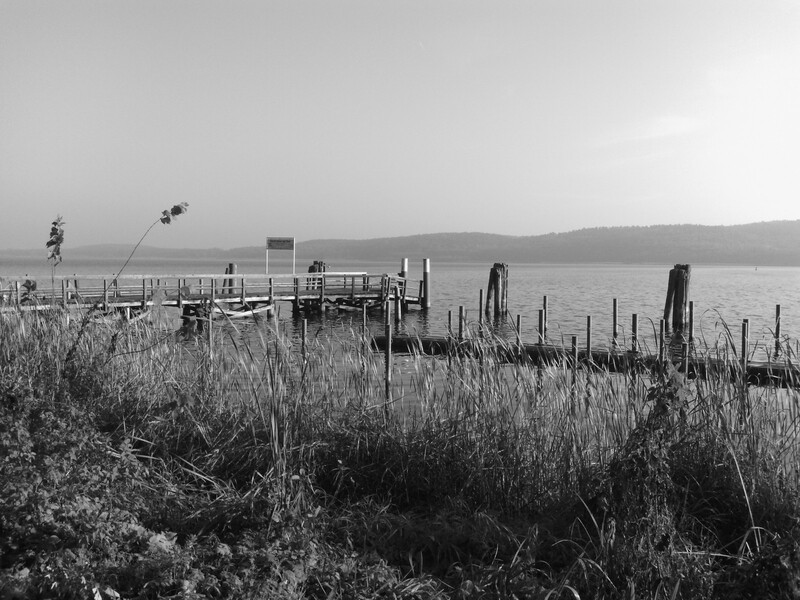 More or less intense reflections develop in sunlight. 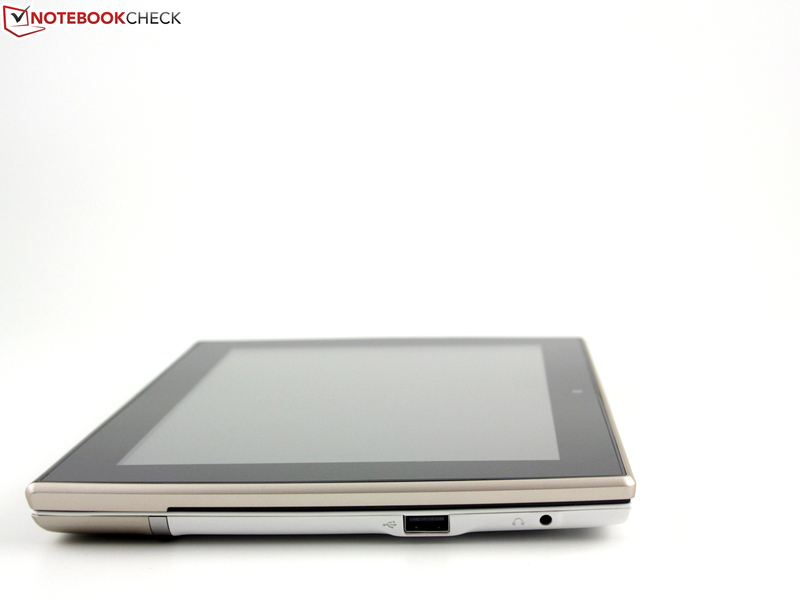 All consumer tablets have this negative trait, without exception. 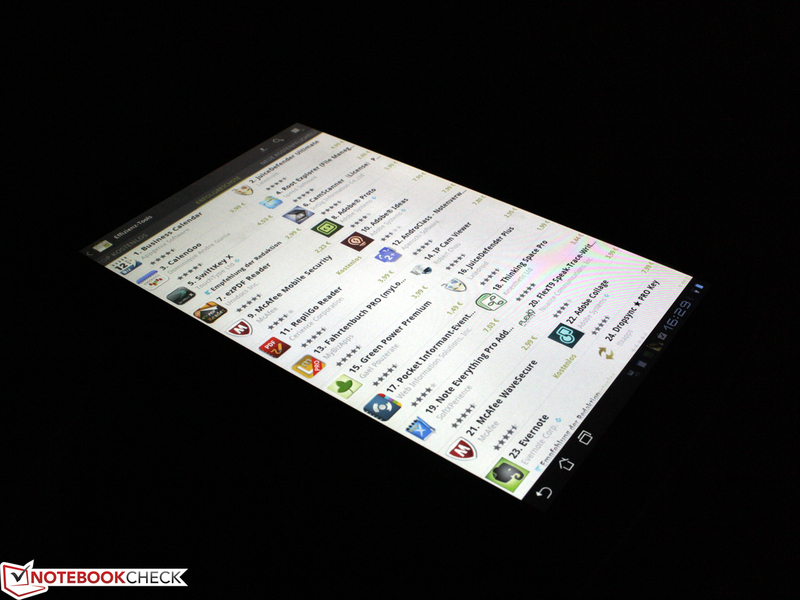 The very wide viewing angles are typical for an IPS screen. We see an undistorted image from every angle. 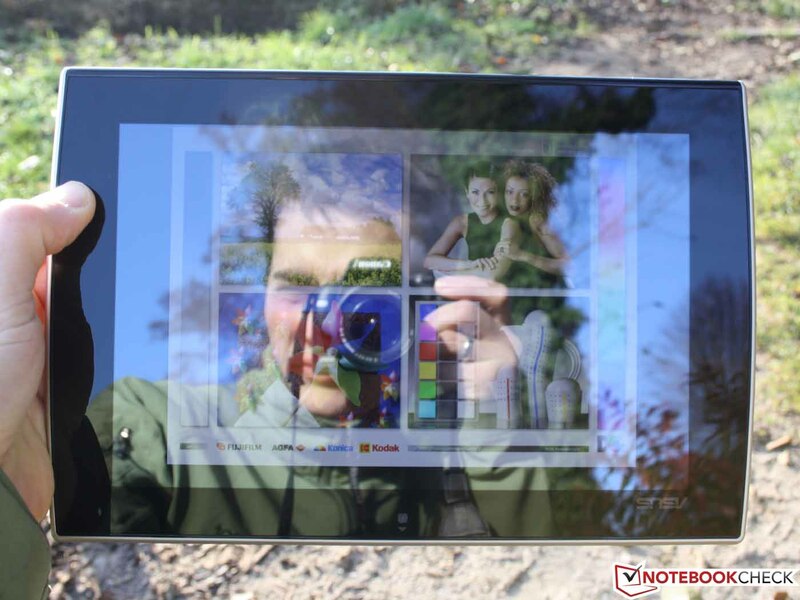 Ghosting created by color inverting as known from notebooks (and low-cost tablets) doesn't arise. 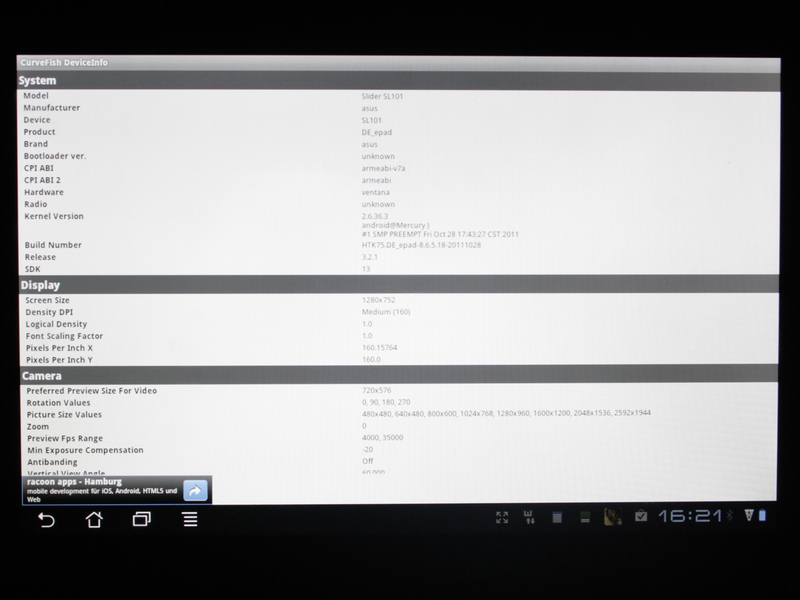 However, an IPS screen isn't anything special among high-end tablets. 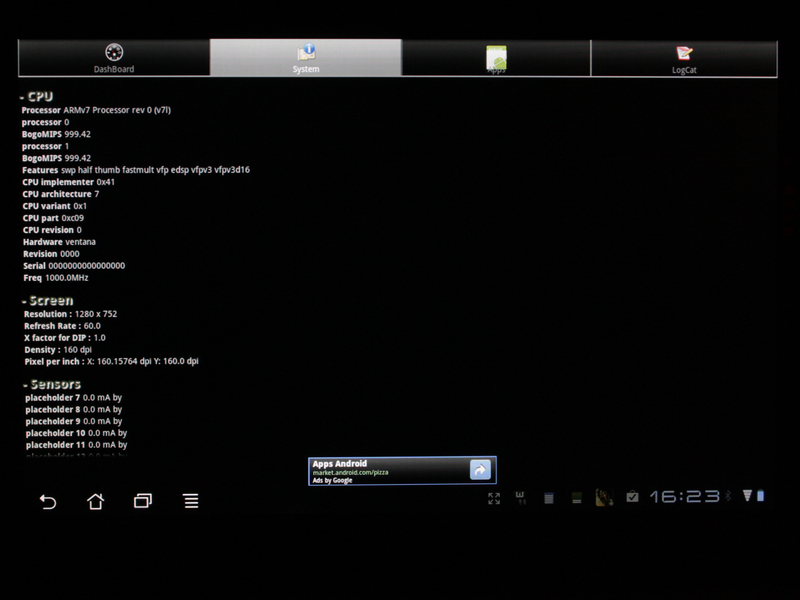 Lateral viewing on the iPad 2, BlackBerry Playbook, Galaxy Tab 10.1 and Motorola Xoom is perfect from all directions. 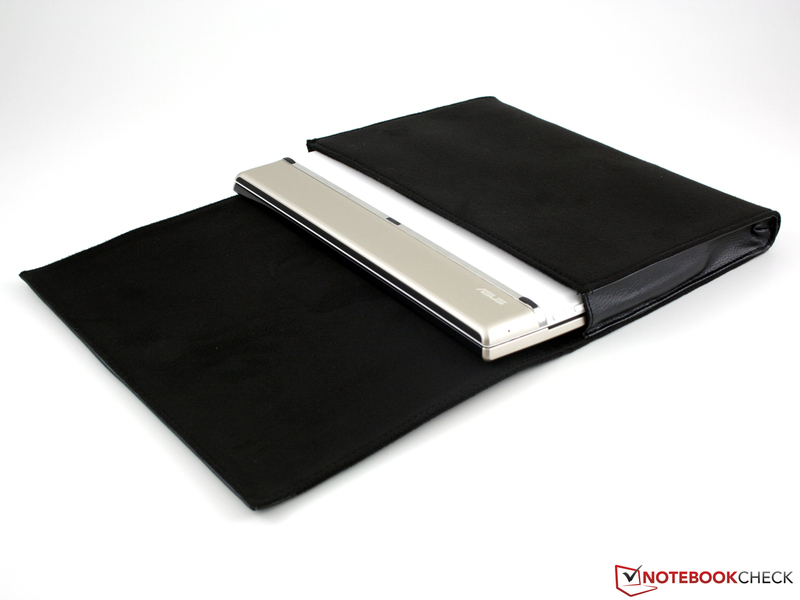 The first rate viewing angles can hardly ever be compared with notebooks because only some workstations, expensive professional subnotebooks or a few gaming and multimedia machines play in this league. Examples would be the recently reviewed MSI GT780DX-i71691BLW7H or the Samsung Series 7 Gamer 700G7A. The only compact candidate: Lenovo Thinkpad X220. 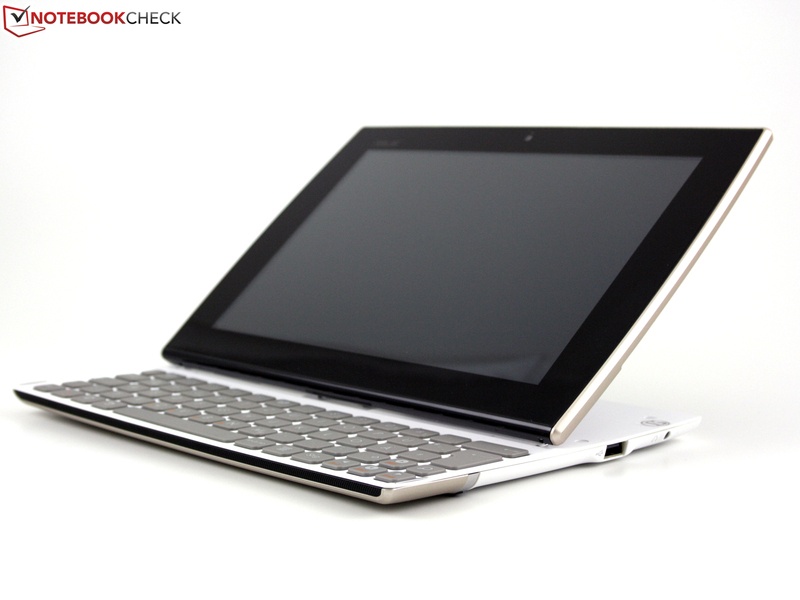 Alike so many tablets, the Slider SL101 is equipped with Nvidia's Tegra 2 processor (2 x 1 GHz). 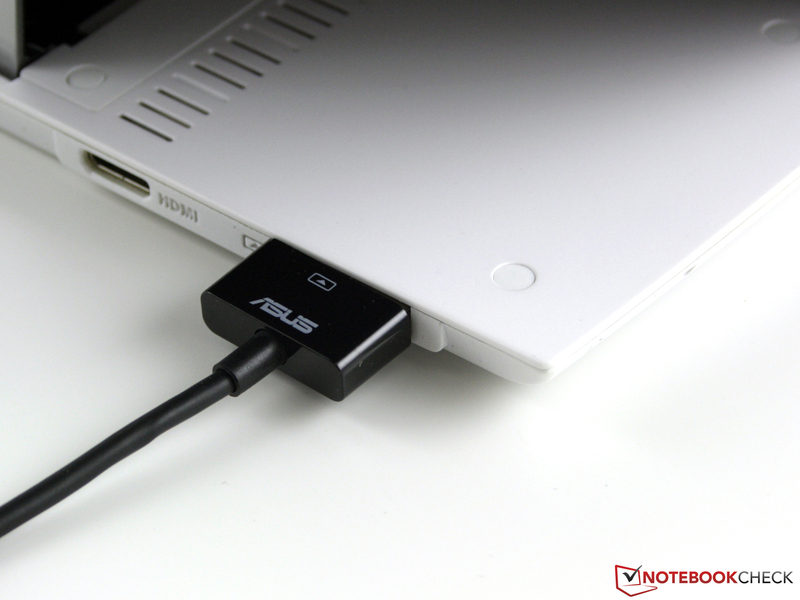 Asus already used this platform in the Eee Pad Transformer. Tegra 2 is a system on a chip (SoC). That means a dual core Cortex A9 CPU, a GeForce GPU (ultra low power), RAM and video processor are bundled on one chip. A 32 GB eMMC is used as the memory. This so-called "embedded multimedia card" incorporates an MMC interface, the flash memory and the controller in a BGA package. Short: The memory isn't inserted, it's soldered. 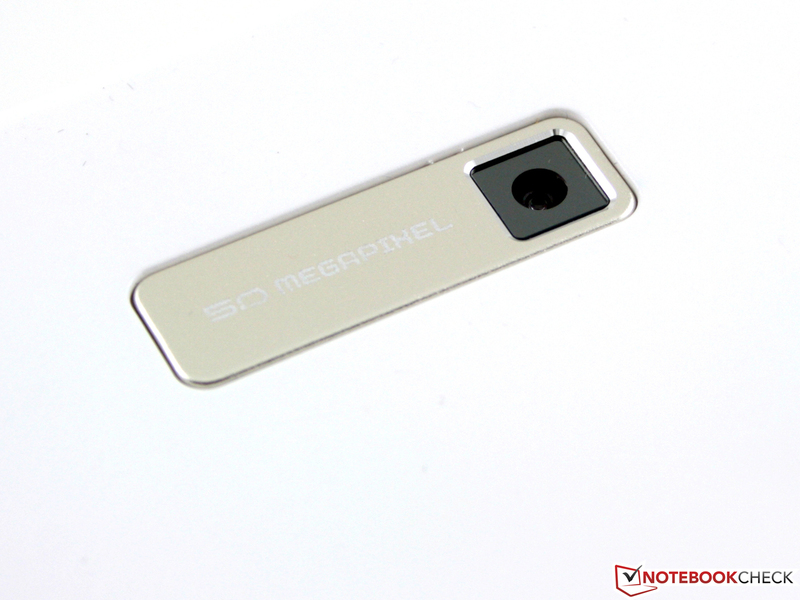 It can be expanded via a microSD with up to 32 GB (SDHC). The system has a nominal clock of 2 x 1000 MHz. However, depending on the application, it can clock with eight other phases: 912 MHz, 816, 760, 608, 456, 312, 216 or deep sleep. Since we disabled standby for the test, the Slider never fell into deep sleep. Instead, it frequently clocked with 216 MHz in idle. The advantage of such a variable clock is known: Like in notebooks that have Turbo Boost, energy is saved and that results in long battery runtimes. The Quadrant benchmark (CPU, GPU test) couldn't be executed. The Slider is in a good midfield in Smartbench 2011 (CPU, GPU test). This applies to both the productivity and the game index. The latter lags slightly behind the Tegra 2 comparison systems when looked at closer. Samsung's Galaxy S2 smartphone with a 2 x 1.2 GHz Exynos 4210 GPU currently achieves about 3600 game index points. The LG Star manages about 3115. So, the development doesn't stand still; Tegra 2 has been on the market for almost a year and Nvidia is tinkering on the successor Kal-El. 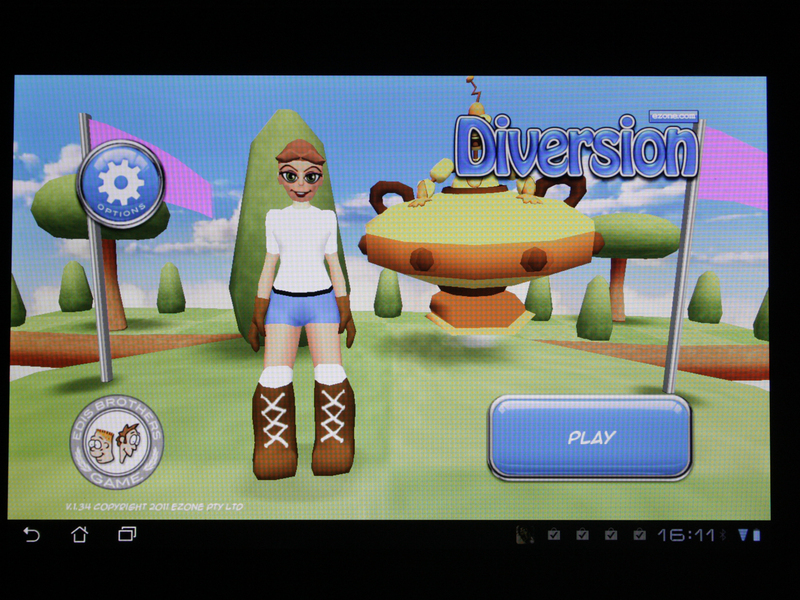 The Android market and the Nvidia Tegra Zone have quite a vast collection of games in the meantime (fee-based/free). Games for tablets aren't comparable with PC games in their circumference and 3D representation. Nevertheless, there have been leaps in development within a short time. Nvidia's Tegra 250 chip is equipped with a mini graphics that calculates on 8 cores (4 pixels, 4 Vertex Shaders). We tried the games depicted below and all worked properly and smoothly with exception of World War. 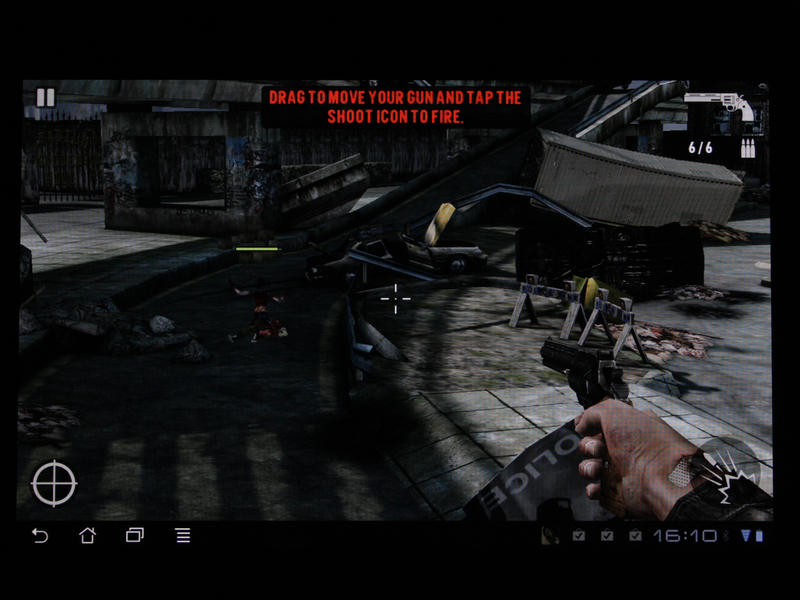 The screenshots are to provide an impression of the extensive possibilities for passing time with the Slider. The Slider SL101 works absolutely without noise. 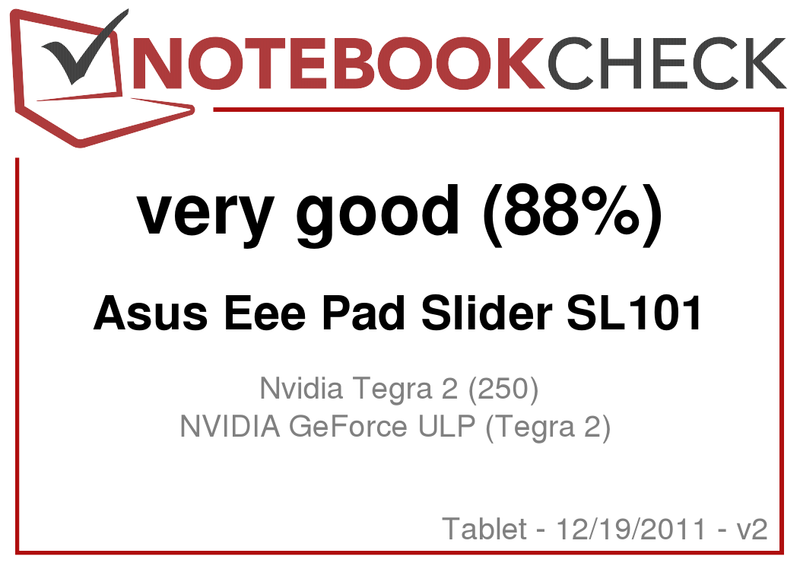 This is the case for all Tegra 2 tablets. 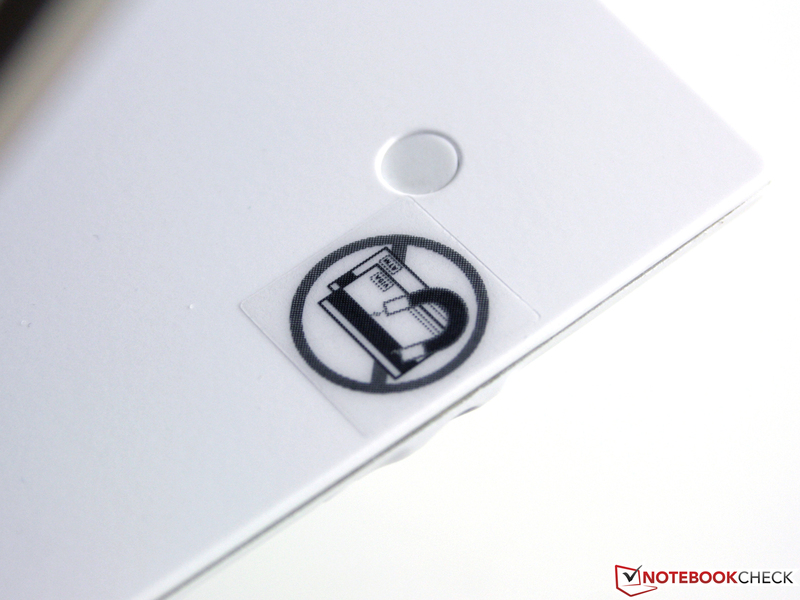 Due to the low thermal dissipation of only one watt, the waste heat can be discharged over the case. The lower case doesn't even get lukewarm in idle and Internet surfing. 21 degrees Celsius is the maximum rate. The lower case heats up more than the upper part during constant load induced by a HD trailer. We measured 33 degrees selectively. The Tegra 2 chip is located here in the lower case. The screen area always stays cool. The Slider proves to be exemplary in waste heat issues. 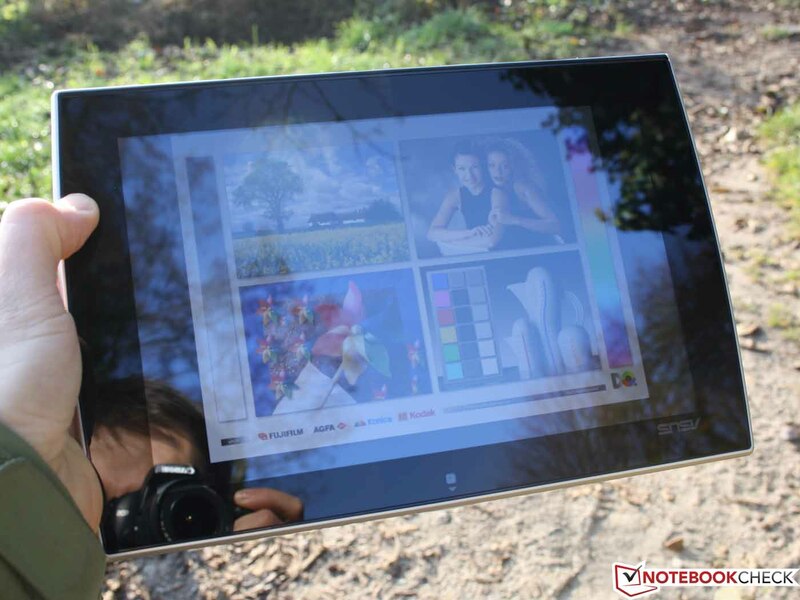 The measurements were executed in the closed tablet mode. A low waste heat temperature isn't always a matter of course. 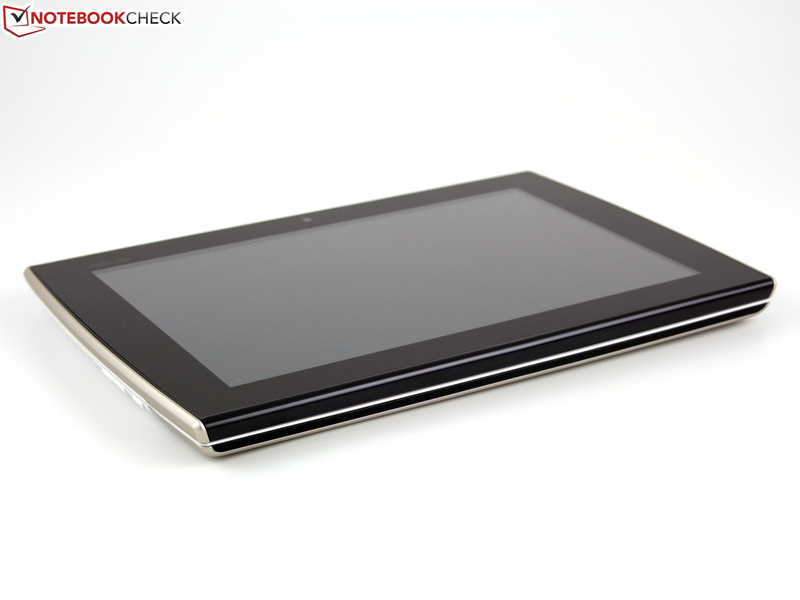 We experienced much higher temperatures in the Sony Tablet S (up to 38°C) and the BlackBerry Playbook (up to 37°C). (+) The average temperature for the upper side under maximal load is 25.2 °C / 77 F, compared to the average of 30.7 °C / 87 F for the devices in the class Tablet. (+) The maximum temperature on the upper side is 27.5 °C / 82 F, compared to the average of 34.8 °C / 95 F, ranging from 22.2 to 51.8 °C for the class Tablet. 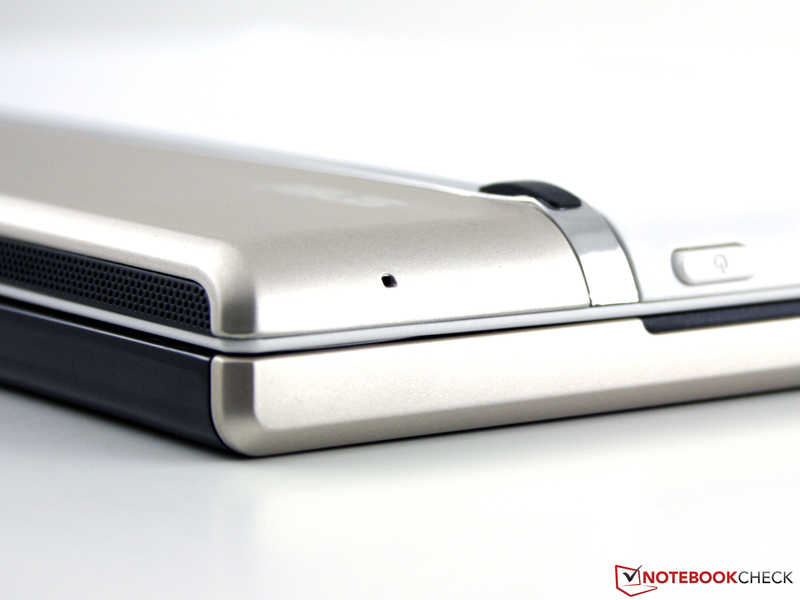 The mono speaker is located directly underneath the foldable screen beside the hinge. Thus, the sound is afflicted when the screen is closed. The thin sound already doesn't have any basses and is unbalanced in keyboard mode (opened) (no stereo), but only a very flat sound remains in tablet mode. The volume can be controlled via a rocker on the left. An analog, 3.5 mm plug fits into the headphone jack. The volume at this outlet and for the internal speaker can be set independent of each other. Thus, the speaker doesn't inevitably explode when the plug is disconnected. We measure the Slider SL101's power consumption in front of the power supply unit, which can deliver a variable voltage of 5 or 15 volts and a current of 10 to 18 watts. 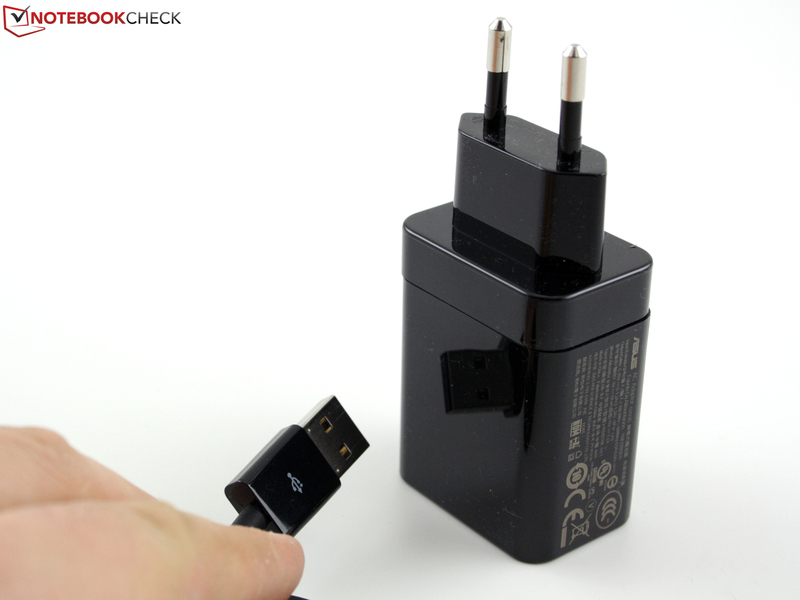 The charger, as a USB connector, can be disconnected and used as a data cable to the PC. 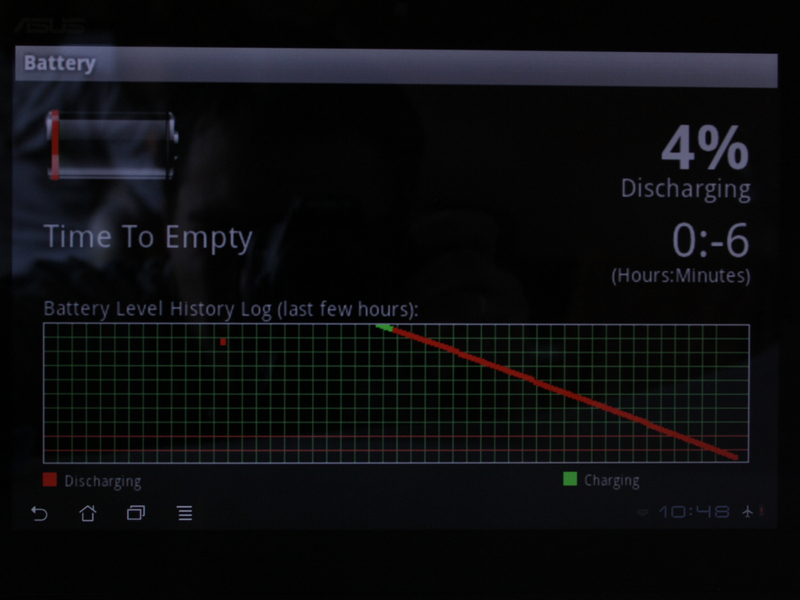 Recharging isn't possible with the PC though (USB 2.0/3.0). The battery was fully charged for the assessments. The Slider pulled 2.6 to 4.9 watts out of the outlet in idle. 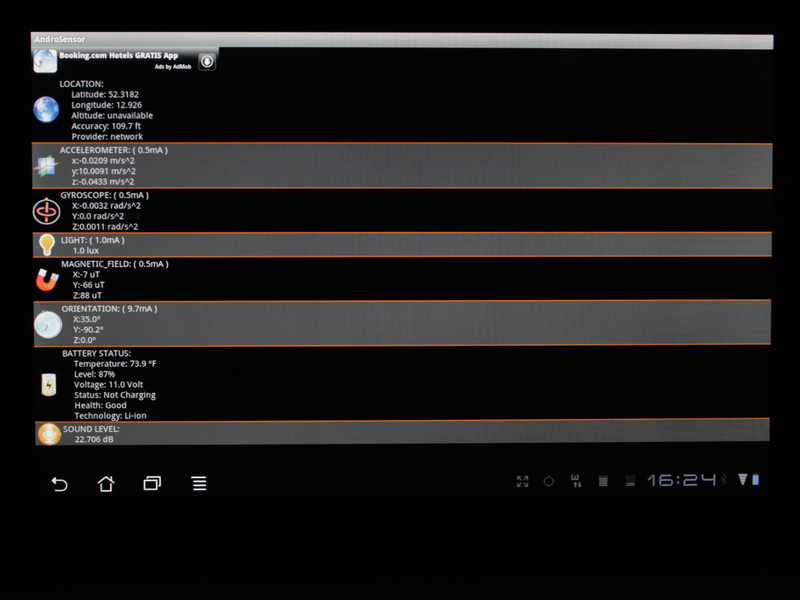 That's not much for a Tegra 2 system: Sony Tablet S (3.1-6 watts), LG V900 (2.2-5.6 watts), Galaxy Tab 10.1 (3.3-6.7 watts). The load consumption of 6.4 watts is a lot higher, e.g. 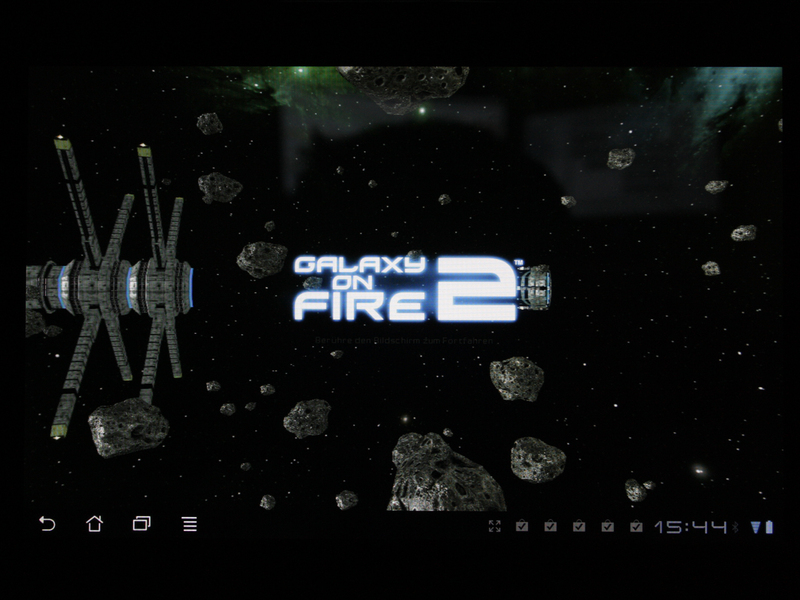 while playing Galaxy on Fire 2. 5.6 watts suffice for a 720p movie. The high standby consumption of 1.3 watts strikes us. The Motorola Xoom (0.1 watts), Galaxy Tab 10.1 (0.6 watts) and LG V900 (0.15 watts) are more energy efficient here. This could result in a quickly drained battery in standby mode. 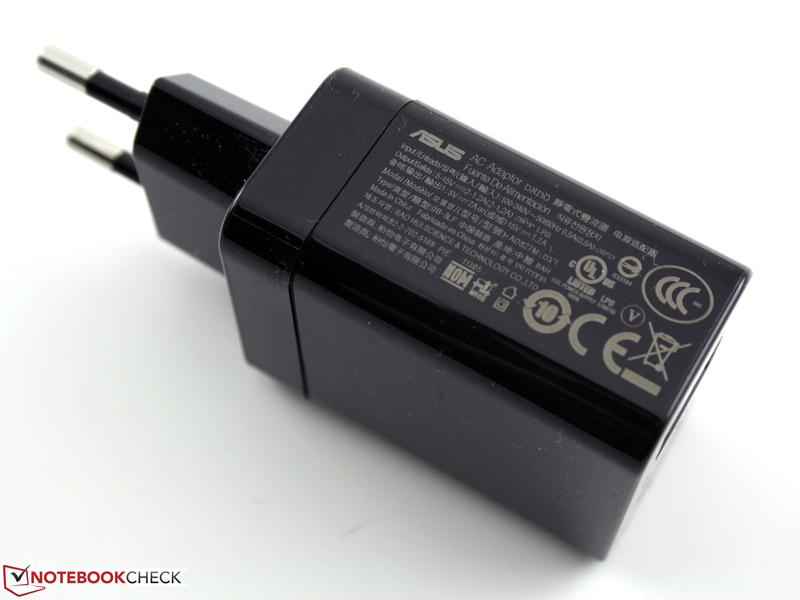 The low power consumption indicates a good battery life. However, we didn't expect the battery runtime in the WLAN test to turn out as good as it did with 9:30 hours. 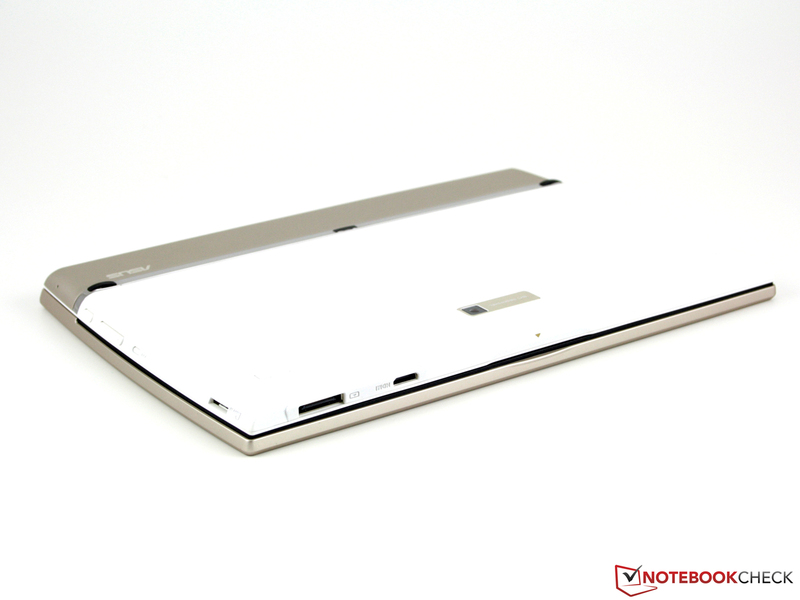 The 18 Wh lithium polymer battery (3 cells, 3700 mAh) is on one level with the device's keyboard. 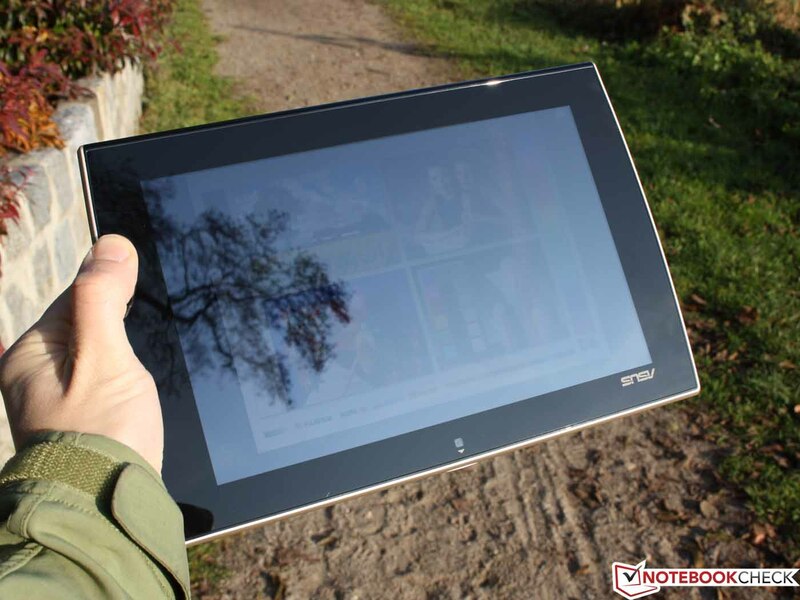 The capacity is a bit lower than other tablets: iPad 2 (25 Wh) or Motorola Xoom (24.5 Wh). 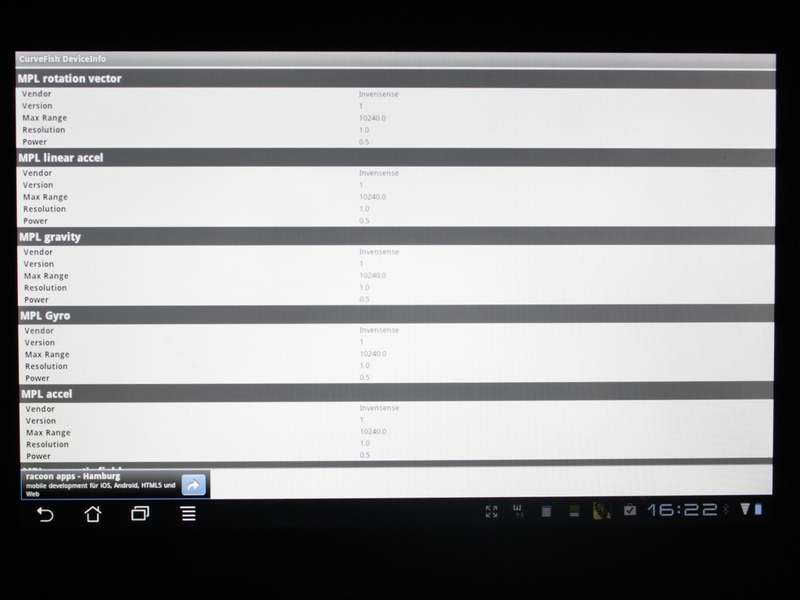 The WLAN test, executed at a brightness of 100 cd/m2, is a mix of website surfing and video clips. 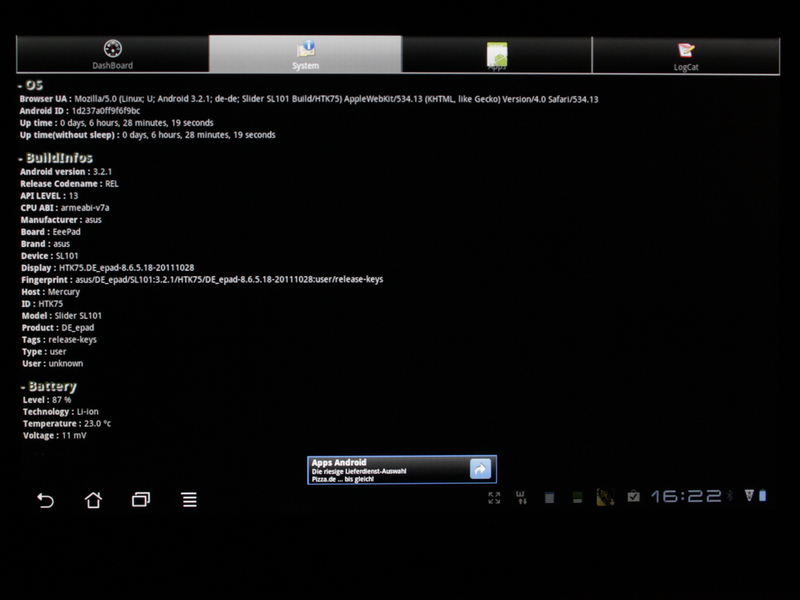 The Galaxy Tab 10.1v achieves the same runtime (9:35 h). The Sony Tablet S (5:30), LG V900 (7:15), iPad 2 (7:30) and Motorola Xoom (7:26) are defeated. 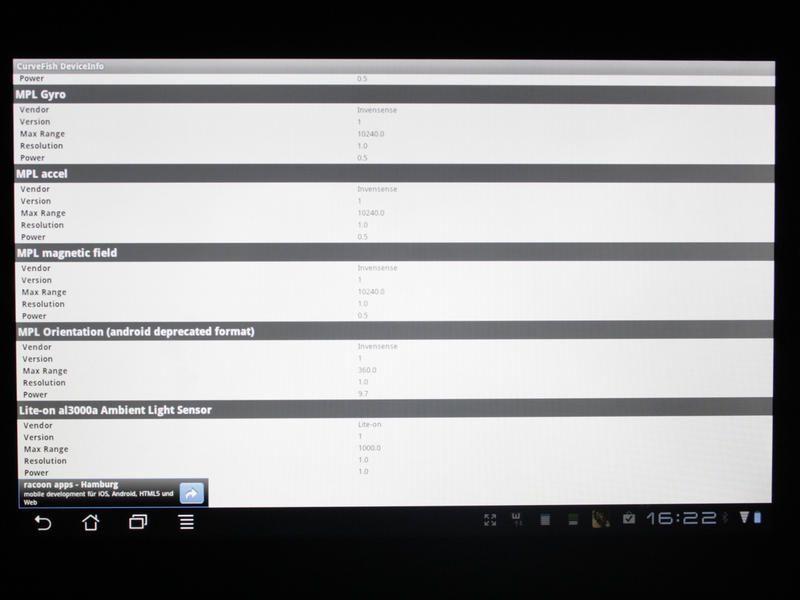 The idle runtime of over 13 hours in minimum brightness and flight mode (wireless off) confirms the WLAN assessment. 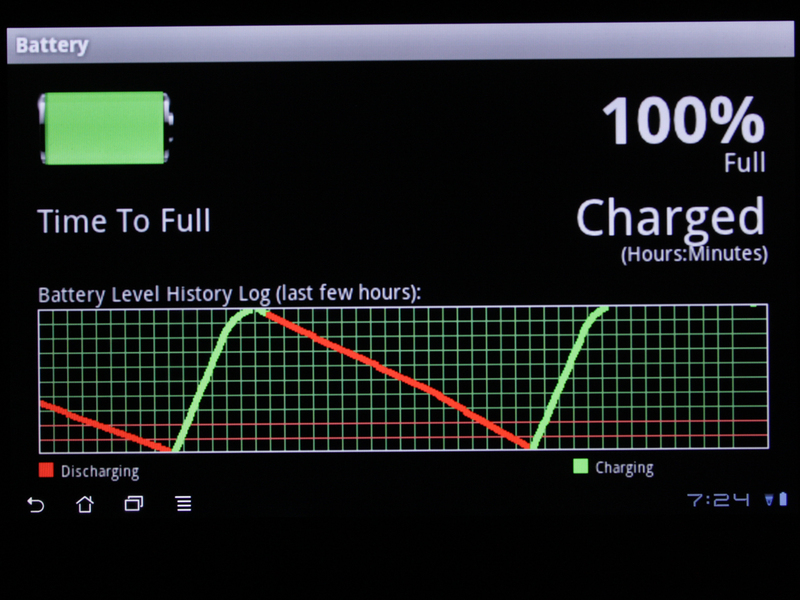 Recharging the battery during use takes three hours. This time is reduced to 2:15 hours in standby. These charging times are acceptable in view of the long battery life. 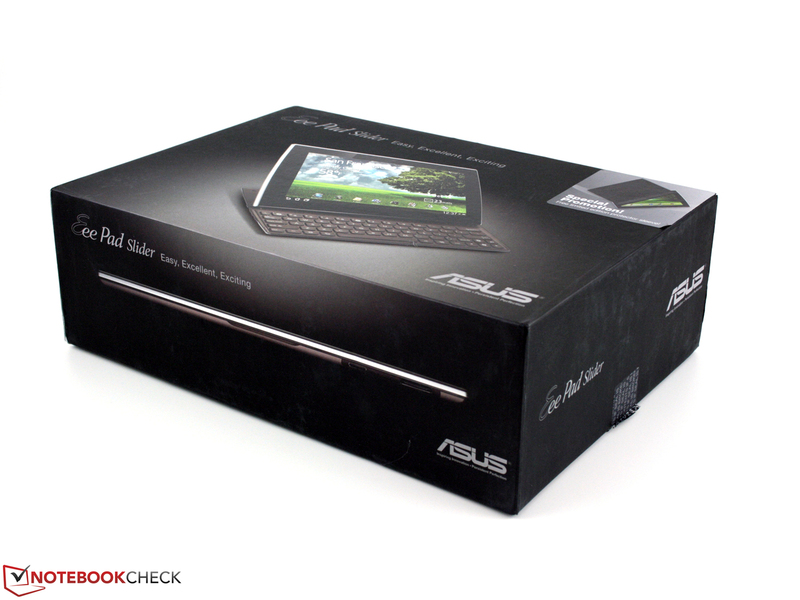 Asus take a shot at a tablet all-rounder and almost hits a home run. 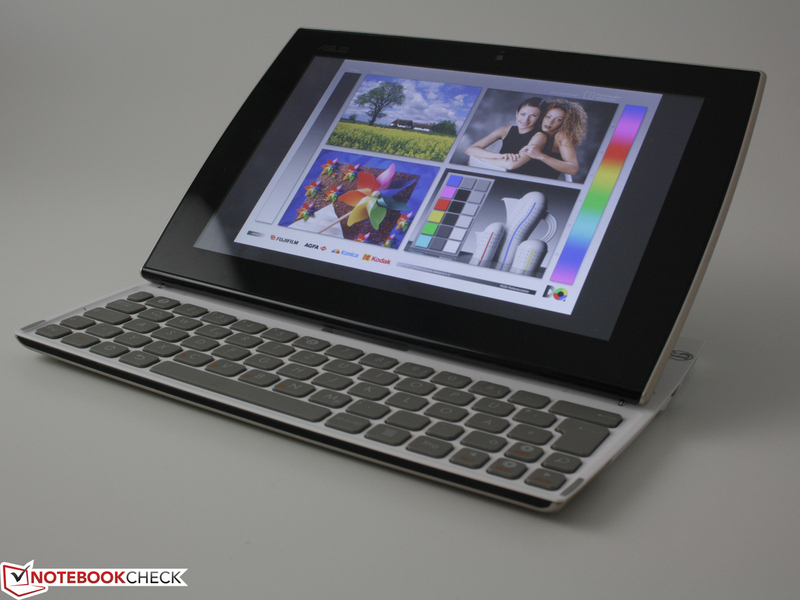 Apart from the high weight and the mediocre quality of the keyboard, we would consider the main tablet criteria as met. The workmanship is very good and the sliding mechanism works perfectly. Although the screen only has a low maximum brightness (for tablet standards), the viewing angles and colors are on a high level. The battery life of 9:30 hours in the WLAN test shows the competition how the job is done properly. The charge time of two to three hours is reasonable. We liked the quality of the 5 MP webcam a lot. It supplies noise-free, focused pictures in daylight. The optical zoom shouldn't be used though. Asus doesn't make any mistakes in terms of interfaces. 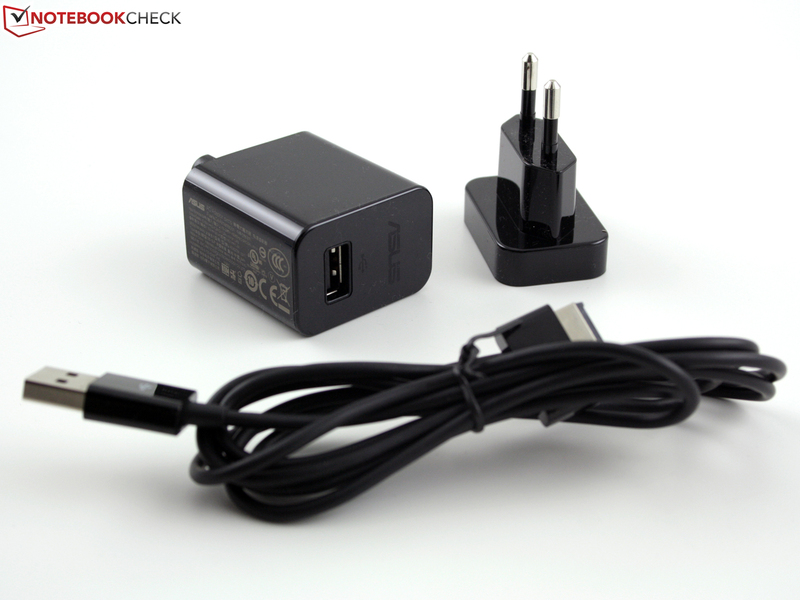 Hardly another tablet can present a mini HDMI and, a total of two USB ports with the charging cable (via 40 pin connector). Those who count every Euro when buying a tablet won't end up with the Asus Slider. €500 is a lot of money, especially among the low-cost competition of 10 inch devices that start at €200. 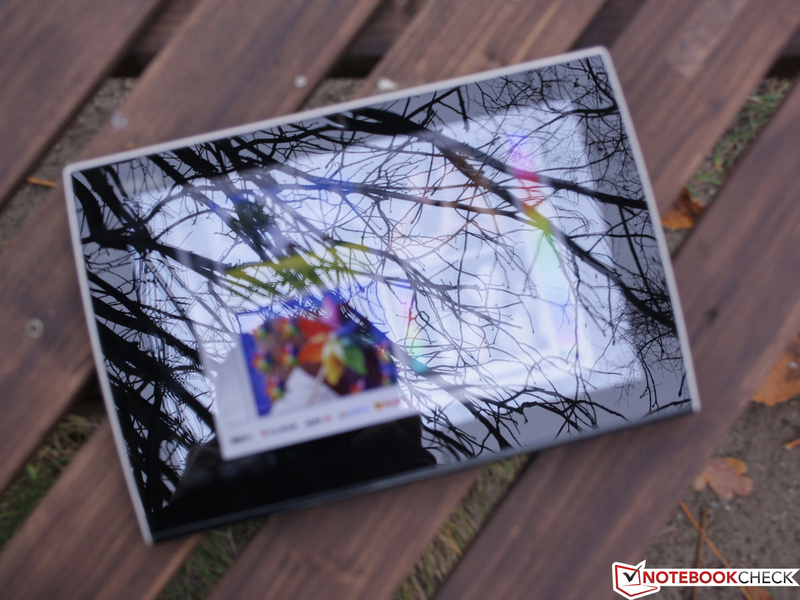 However, the Slider doesn't have to compare itself with these, but sooner with the high-end devices, such as Motorola Xoom (starts at €500), Apple iPad 2 (starts at €440) or Samsung Galaxy Tab 10.1 (starts at €450). In this comparison, and in view of the very good overall rating as well as the unique keyboard feature, we deem €500 as reasonable (market price). 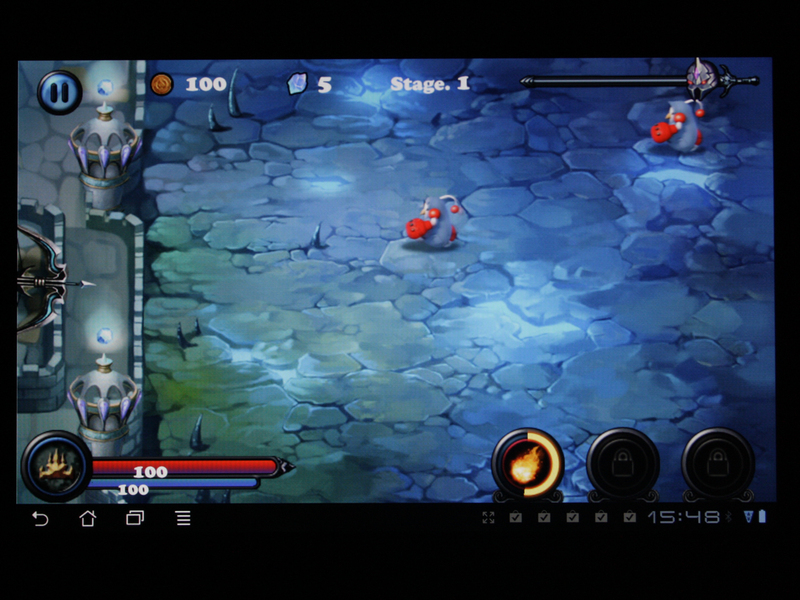 Asus Eee Pad Slider SL101 32 GB: All in one Android tablet with high connectivity and strong battery life. 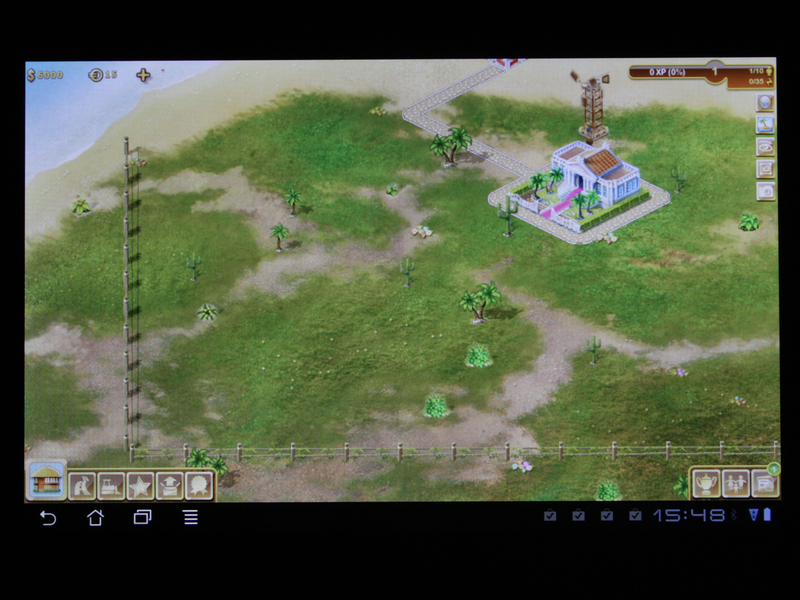 The Asus Eee Pad Slider SL101, a tablet among equals? The card reader reads micro SD memory cards. feels pleasantly non-slip (also silver area). Both halves of the Slider are first opened by pulling (not pushing) this latch. The rear, 5 MP webcam delivers big, clear, undistorted pictures. 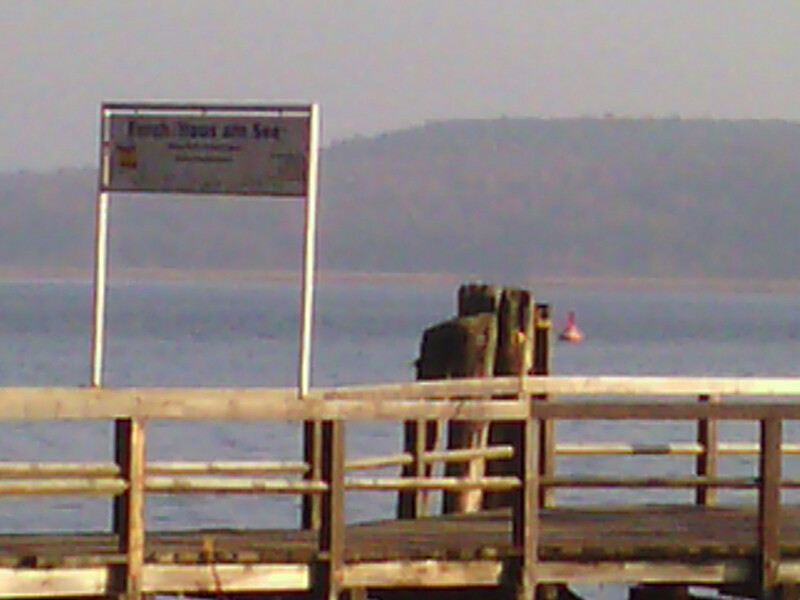 In return, the HD camera (1.2 MP) on the front shoots a faded picture. The Slider's box at least includes a stable case with branding for the high price. It fits the Slider like a glove, but it can't be used in the case. 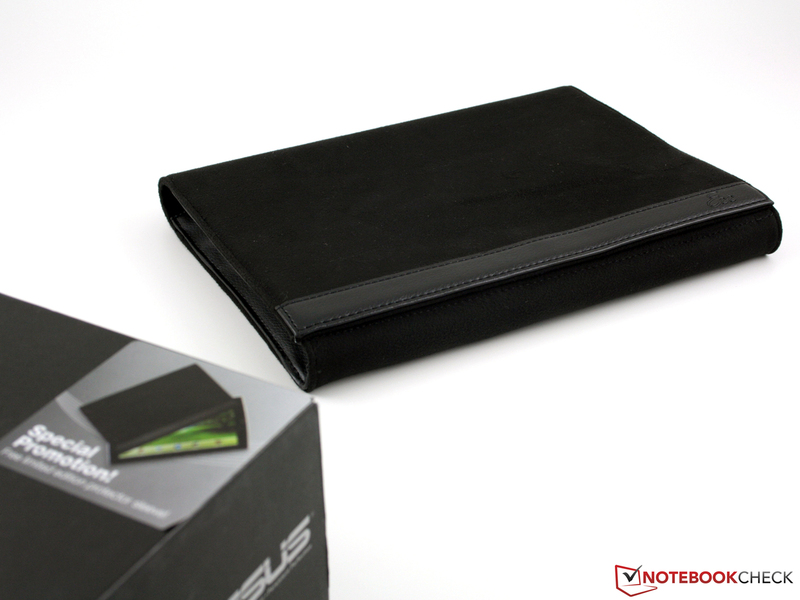 The software, the quick start guide and the warranty card are all found in this high-end box. The comparatively low brightness doesn't show any drawbacks outdoors in the shade. But it gets more difficult in the sun. Reflections are a great ill, as in all tablets. Until now, not one manufacturer has dared to offer a matt screen. the very good lateral viewing angles to the IPS screen. 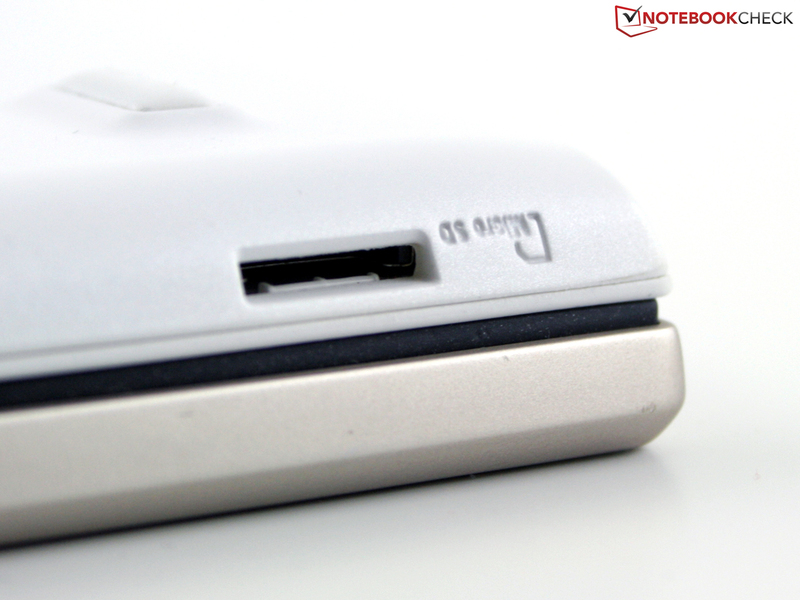 Besides the 40 pin connector for the USB charging/data cable and the mini HDMI port, there is a full-sized USB port. Rather a few more than too few, was the motto for the ports. The Android OS and the 10 inch size indicate that. tablet with a weight of nearly 1 kilogram. a sliding mechanism is concealed. 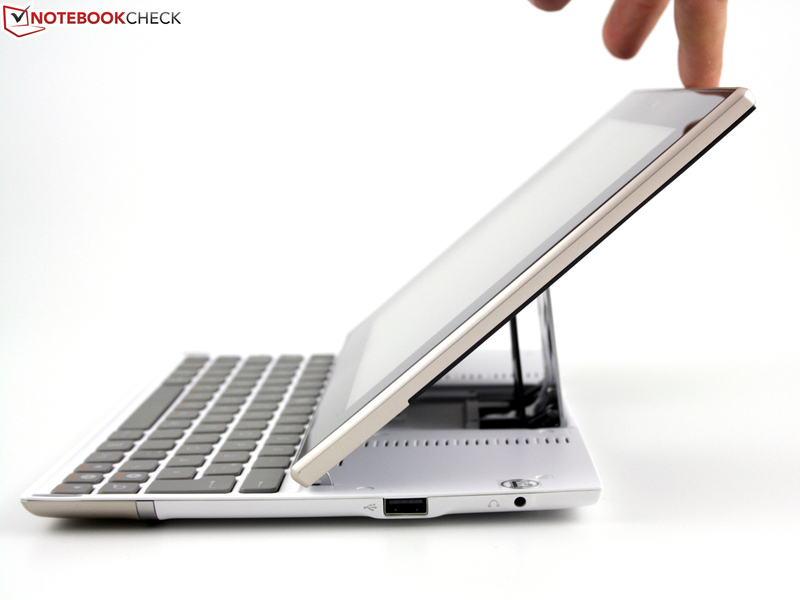 The hinge has a firm grip on the screen. The supporting metal sheet is chrome-plated in high quality. the hinge makes a feasible impression. the screen pushes itself into the final position. The lid hooks itself in two (metal) claws there. a magnet pulls both sides together. There is also a magnetic stop in the front area. That's practically standard in high-end screens. Timeout can finally be disabled, the Slider is permanently on. The folding mechanism seems well-designed and is stable. Why is there no 3G version of the Slider? 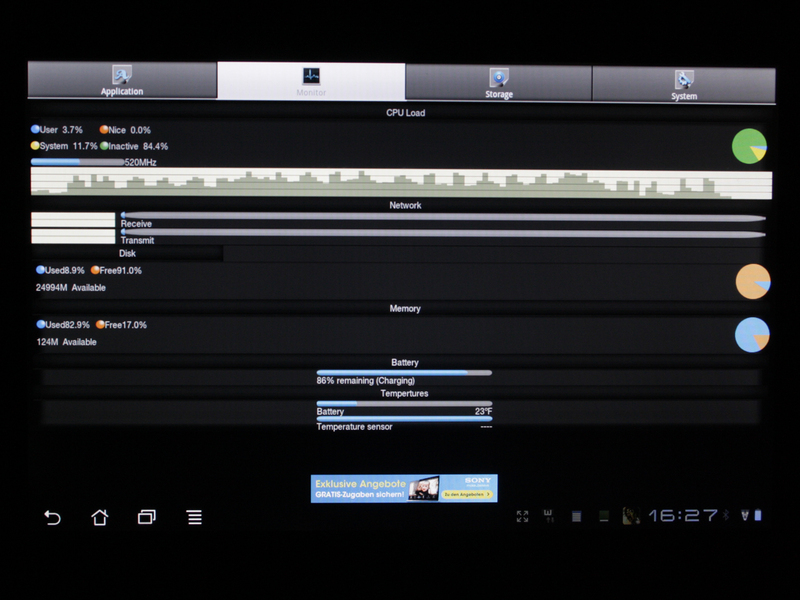 How fast a tablet can mutate to a small tabletop PC - no matter if in the kitchen, living room, bathroom or on the train. Working with the tablet is more efficient.